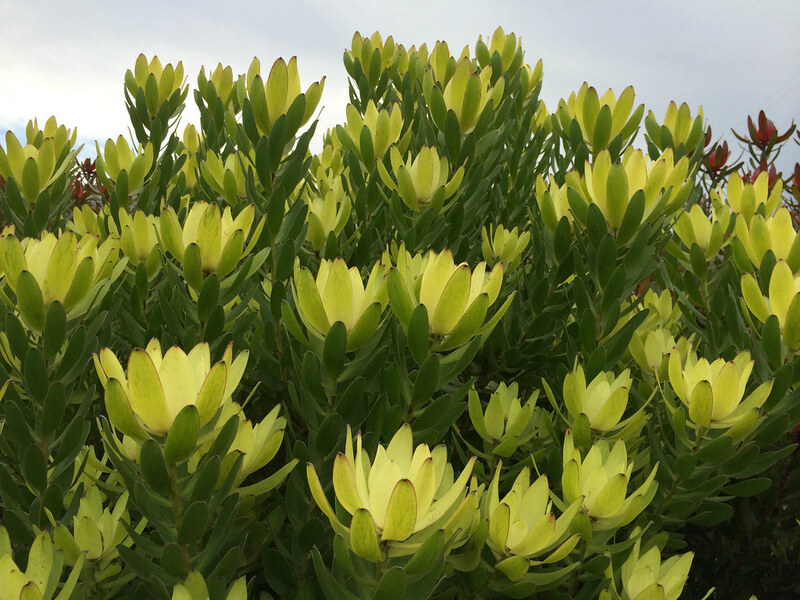 Morro Bay has the perfect cool coastal conditions for growing Proteaceae. 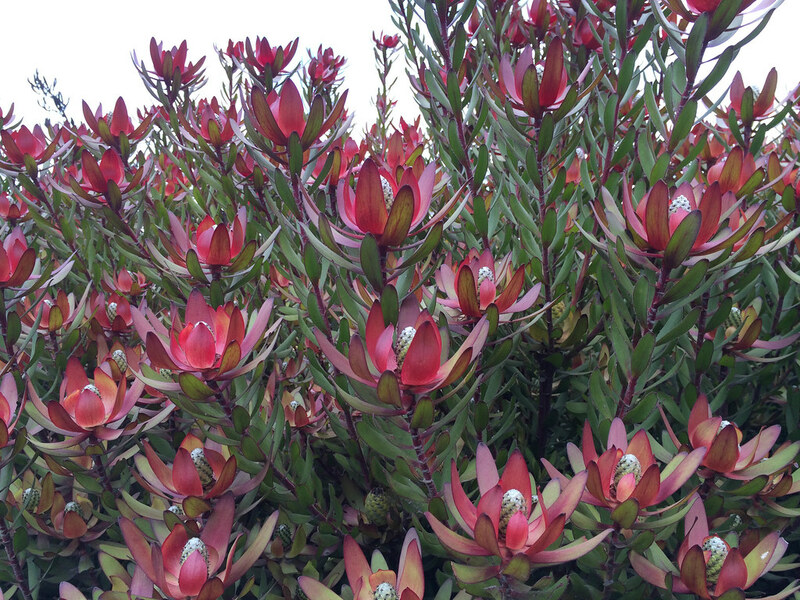 I would say that they are almost as popular here as Rhododendrons and Hosta back in my native northern New Jersey. I’ve been wanting to go around town and take pictures of all of them but just haven’t had the time. 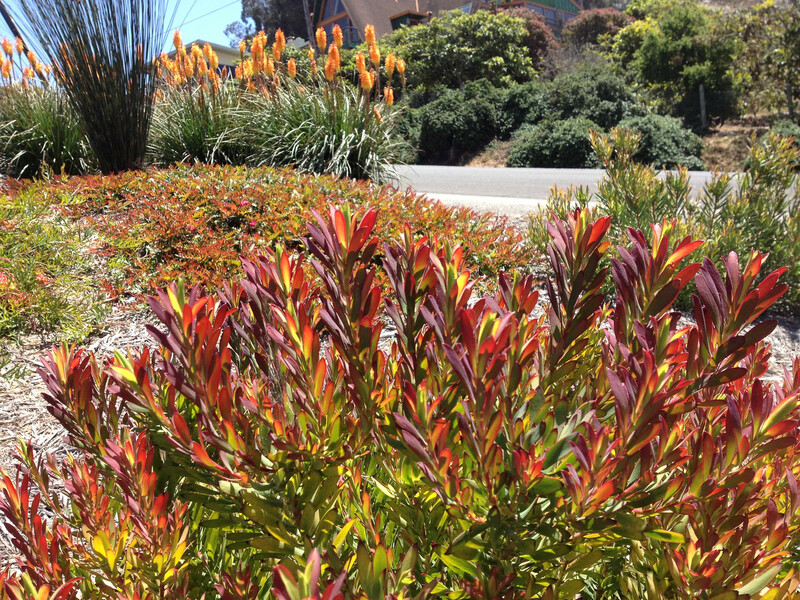 There is one house in particular right in the middle of Morro Bay Heights that has such an amazing display of Leucadendrons that it was worth stopping the car and taking a few pictures. 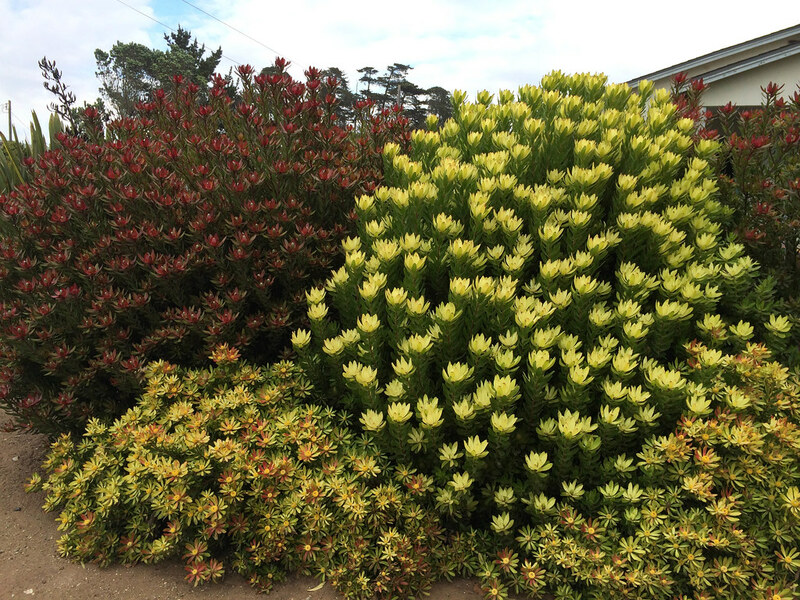 I believe they are the fairly common cultivars ‘Safari Goldstrike’, ‘Safari Sunset’, and ‘Wilson’s Wonder’ and from these photos you will see what makes them so popular. 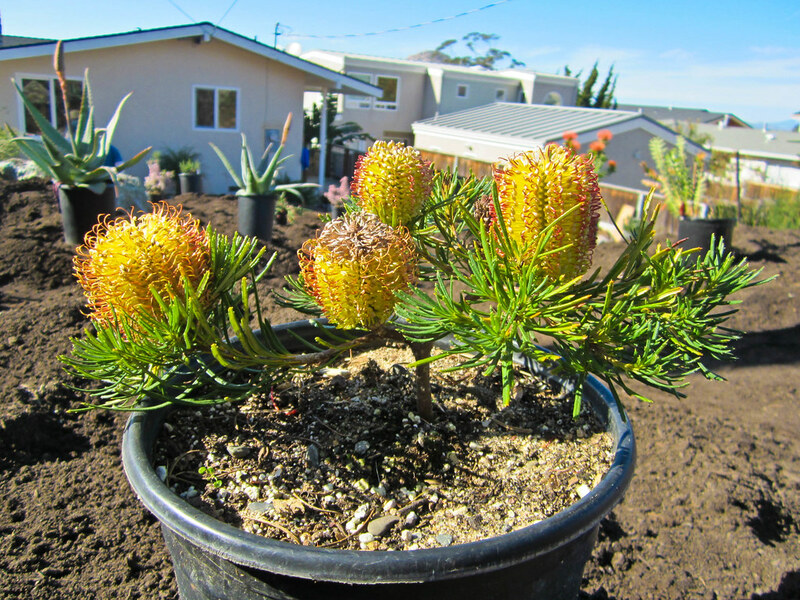 Garden Tour and Far Out Flora Visit! Last Sunday and Monday were very social for me (which is rare – I’m practically a hermit). 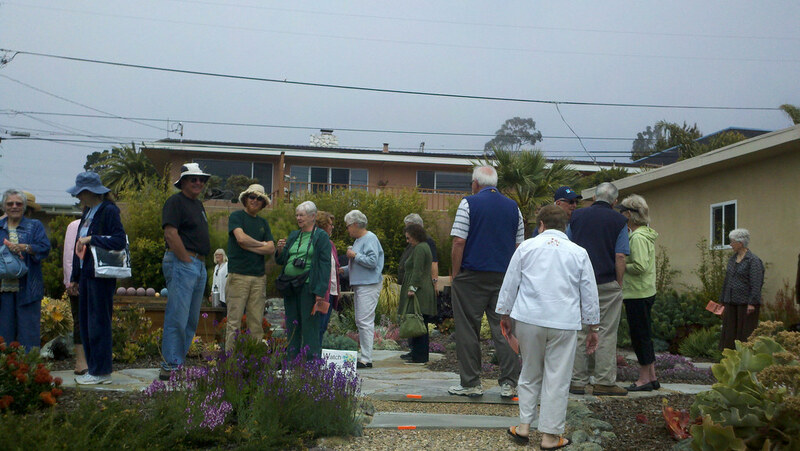 First on Sunday Vince and Janet Marino were on the AAUW garden tour. 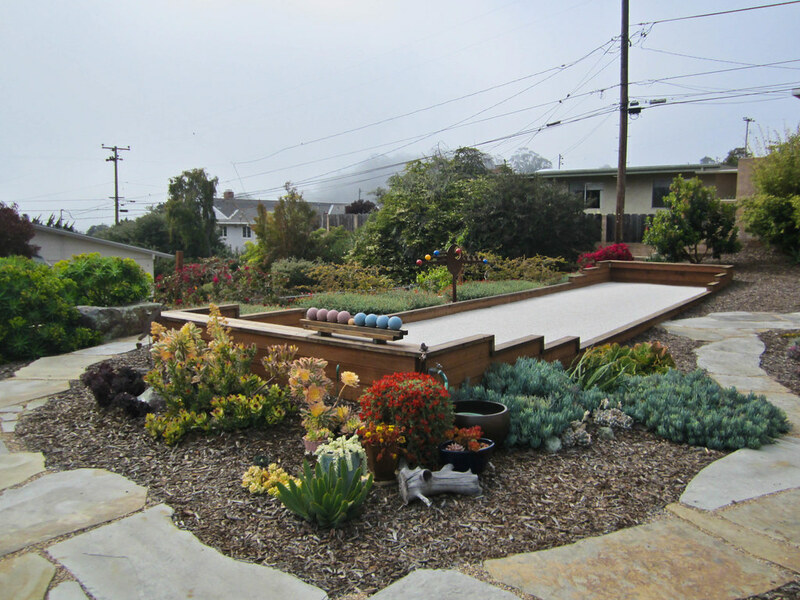 You may remember I blogged about their garden before in my Bocce post. It was their first time on the tour and Gabe was going to be there to help answer questions. 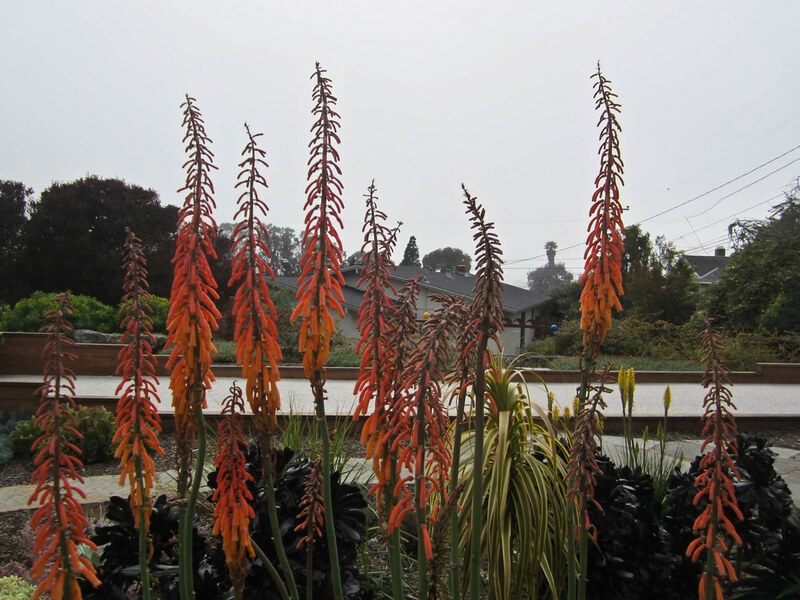 Even though I didn’t design this particular garden I know enough about the garden that I felt like I could be of use answering questions about plants. The garden was looking great! Janet had been slaving away all week making sure that not a single leaf was out of place (the garden has looked great every time I have seen it). 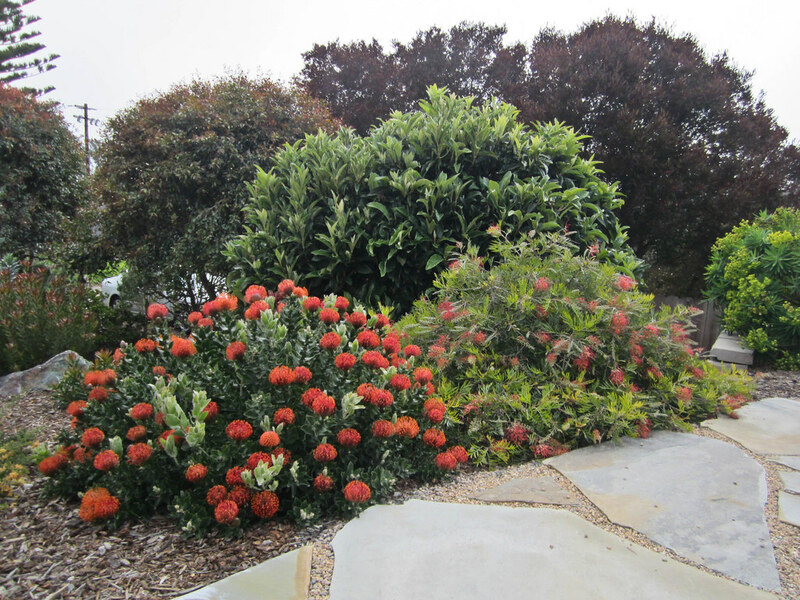 The Leucospermum were still in full bloom and Grevillea ‘Robyn Gordon’ was looking perfect. 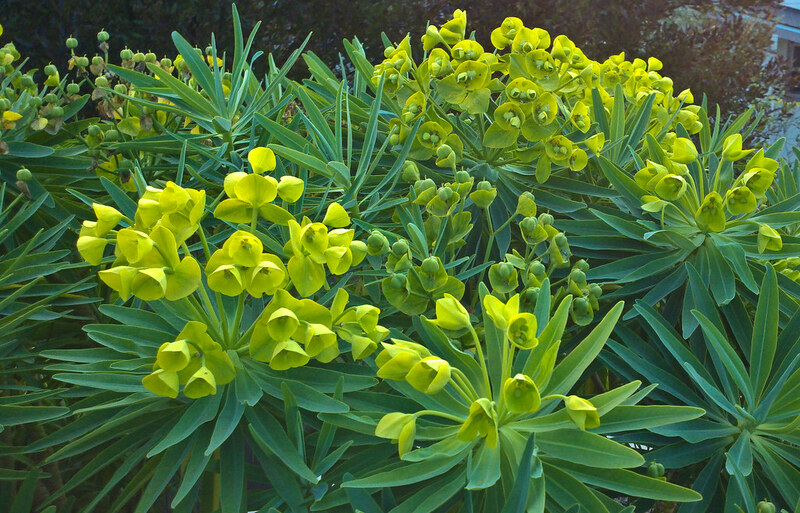 The Euphorbia lambii were looking lush. 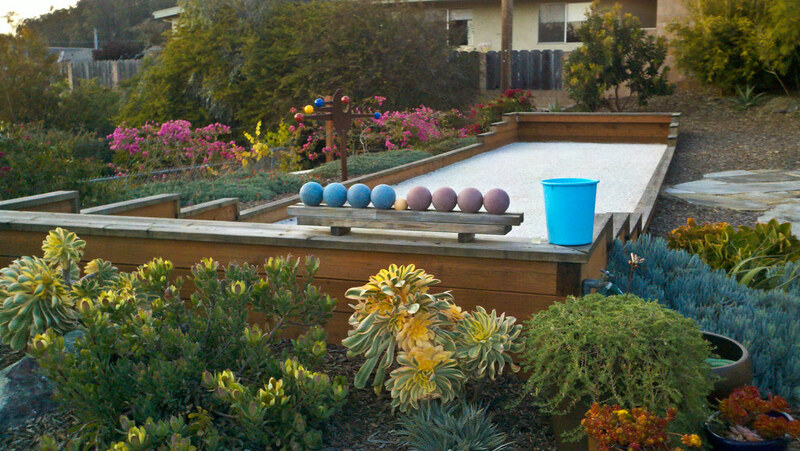 The bocce court was immaculate. 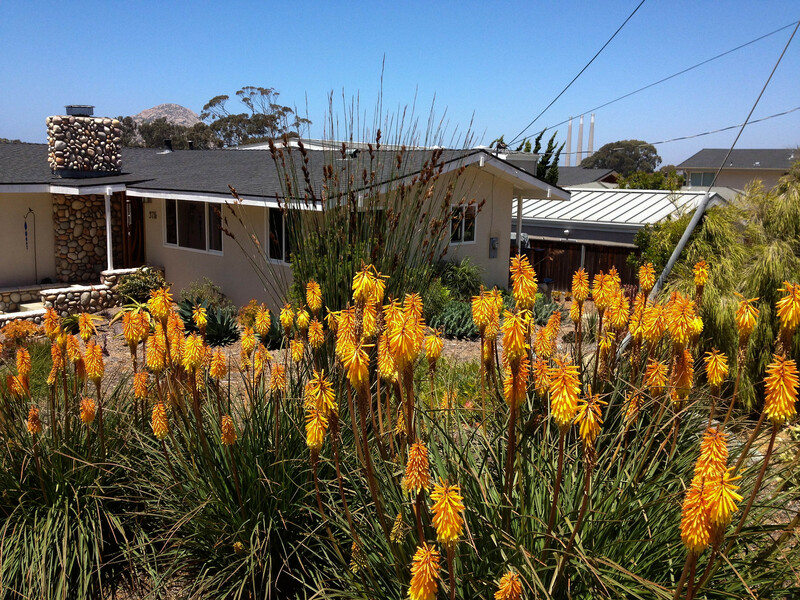 There were several stands of Kniphofia thomsonii and other Kniphofia’s in full bloom. Vince and Gabe greeting visitors. The tour was very successful. Apparently there were over 500 visitors to the garden. I swear at one point in the middle of the day there were 100 people in the garden all at once! 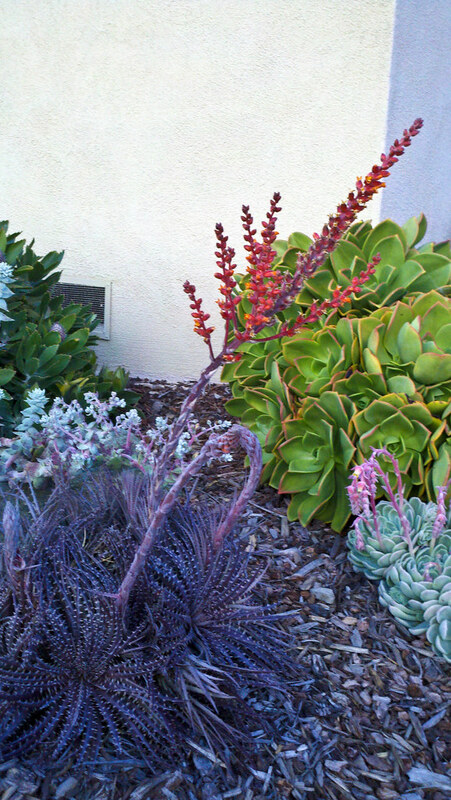 I did try to make myself useful by standing in the lower path and greeting people and answering questions about plants. There were a few plants in particular that I got asked about over and over. 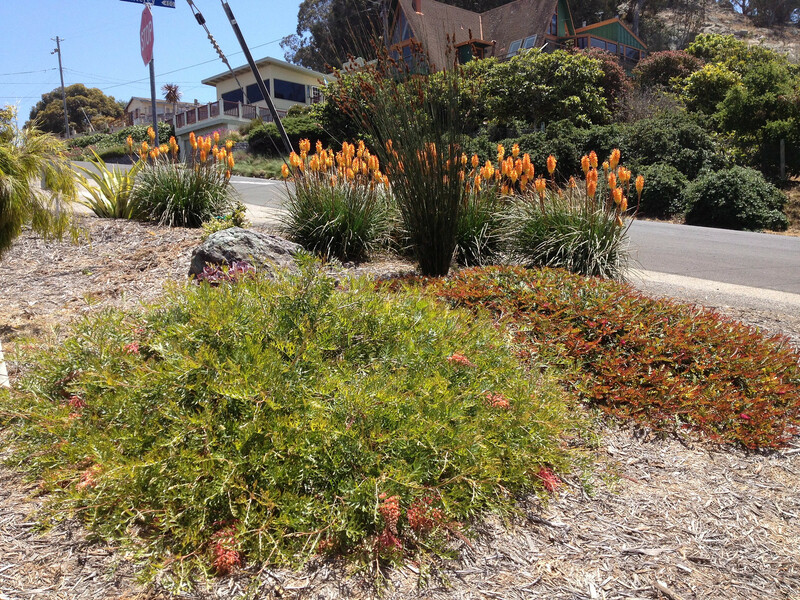 My photo doesn’t do it justice but the groundcover above (with lots of Linaria growing through it) is Grevillea ‘Fanfare’. 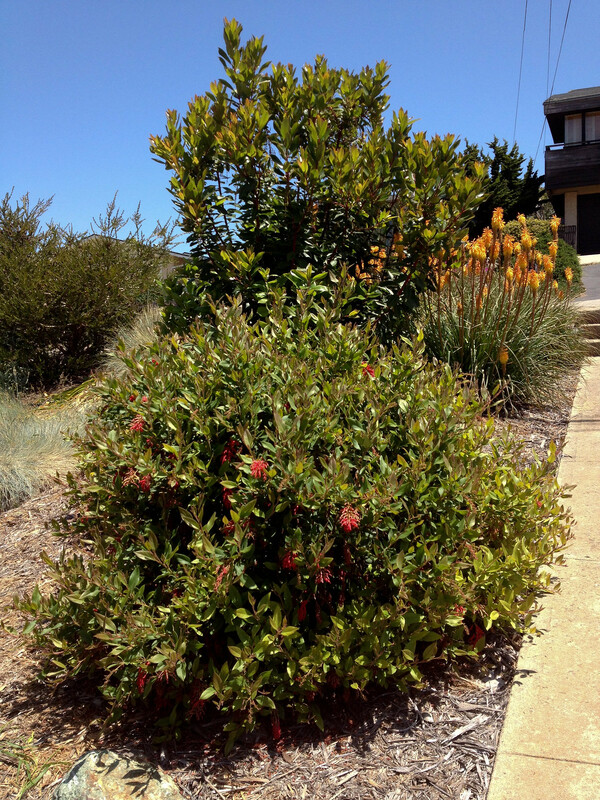 Here is a closeup so you can see the red bottlebrush flowers and red and green oak like leaves. 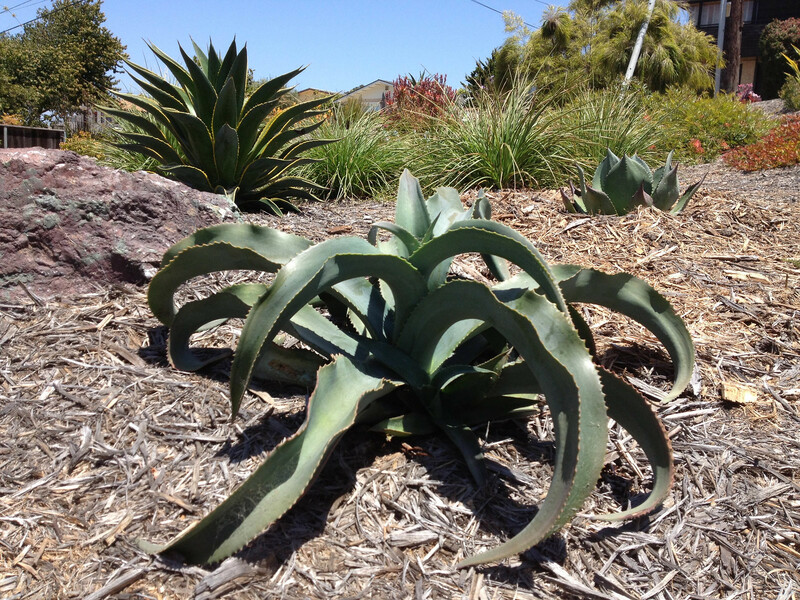 It stays low, just a few inches tall, but spreads out to about 10 or 15 feet across. 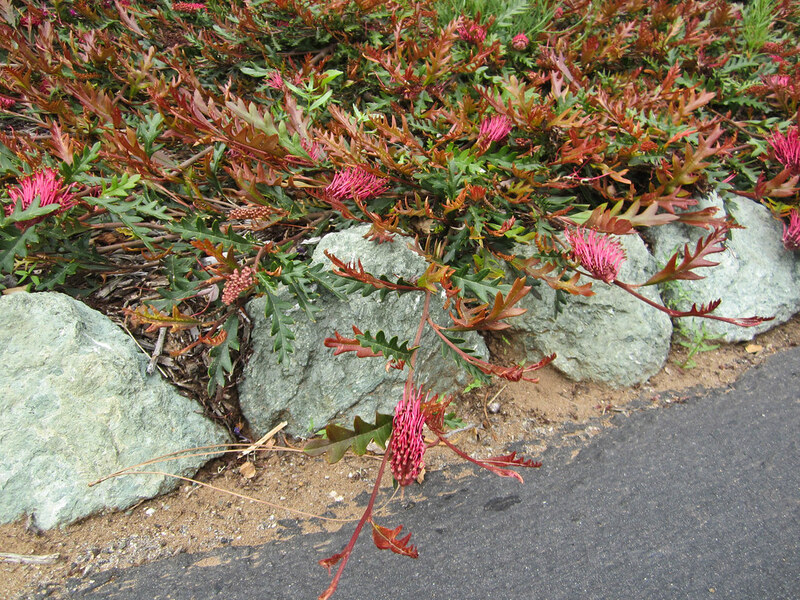 It is planted right at street level and stopped many visitors in their tracks. 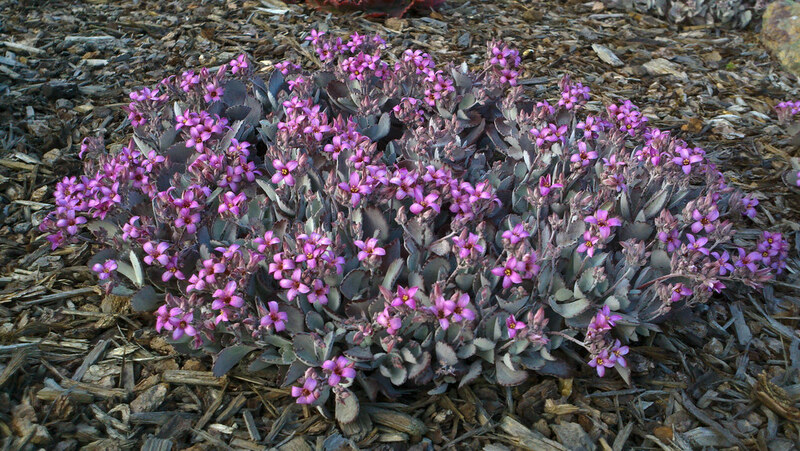 Sedum ‘Coppertone’ was another popular plant. 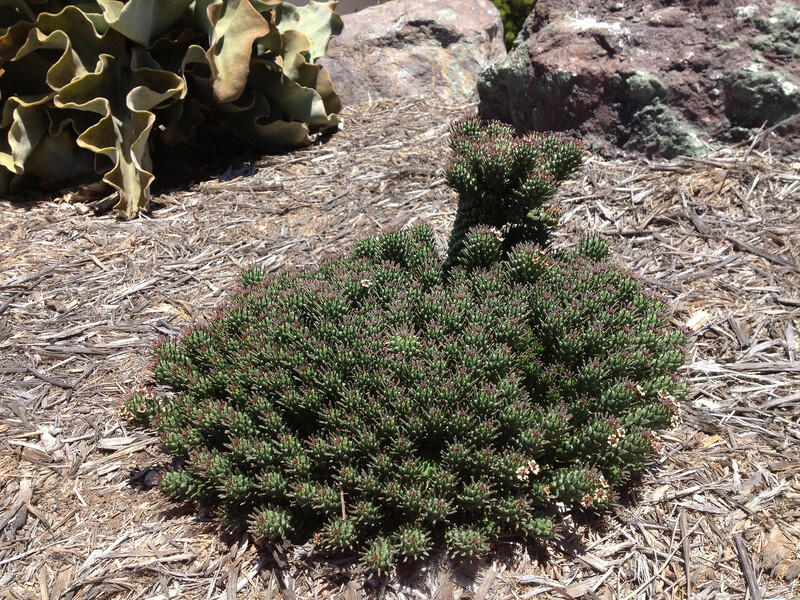 I don’t particularly think of this Sedum as that rare but I have never seen such huge specimens of this plant. 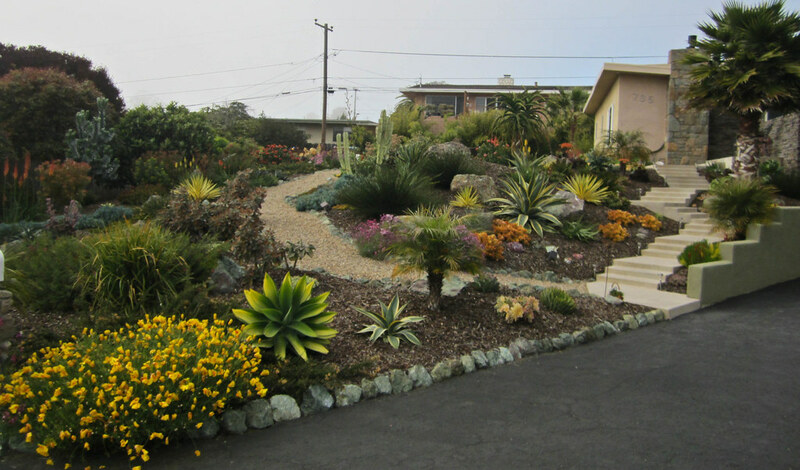 People couldn’t believe that this garden was only about 2 years old and that most of the plants had gone in as gallon sized pots. 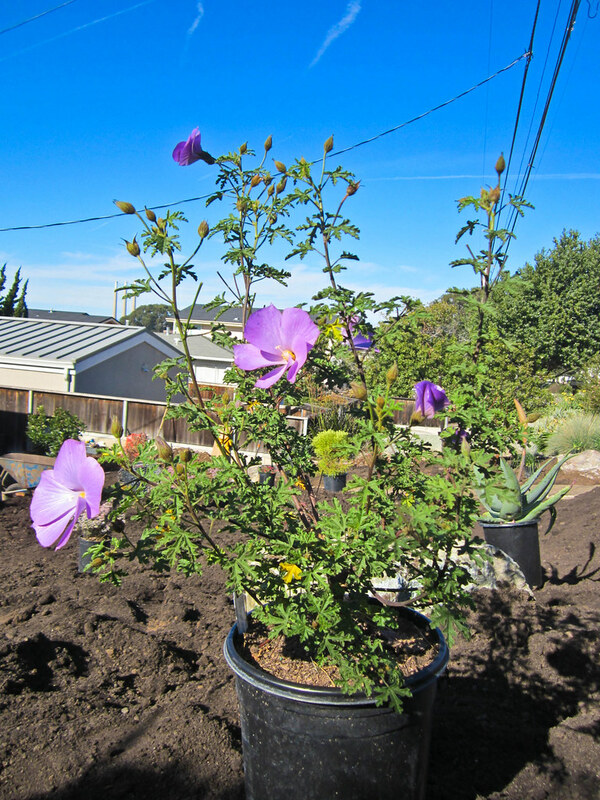 When you have good compost to plant in and that perfect coastal climate things grow pretty fast! 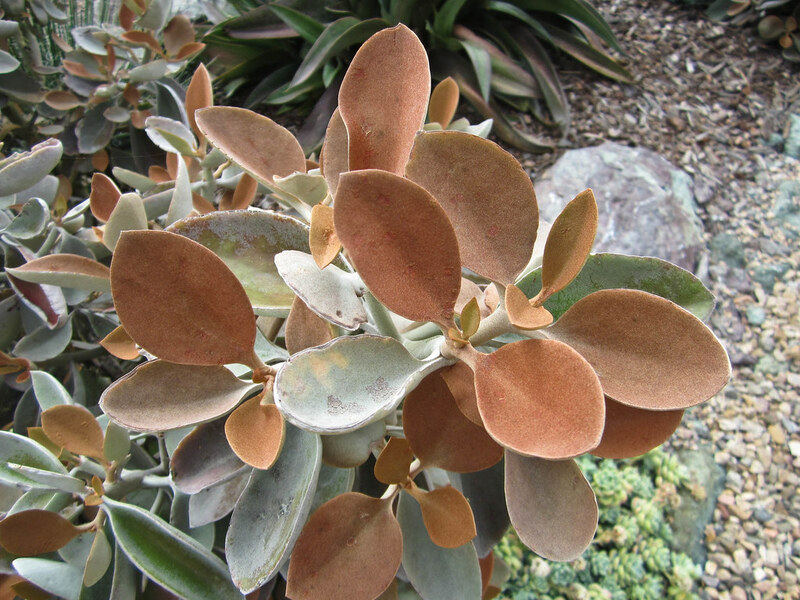 Kalanchoe orgyalis ‘Copper Spoons’ was another popular plant. I felt kind of bad for all the folks visiting from inland. 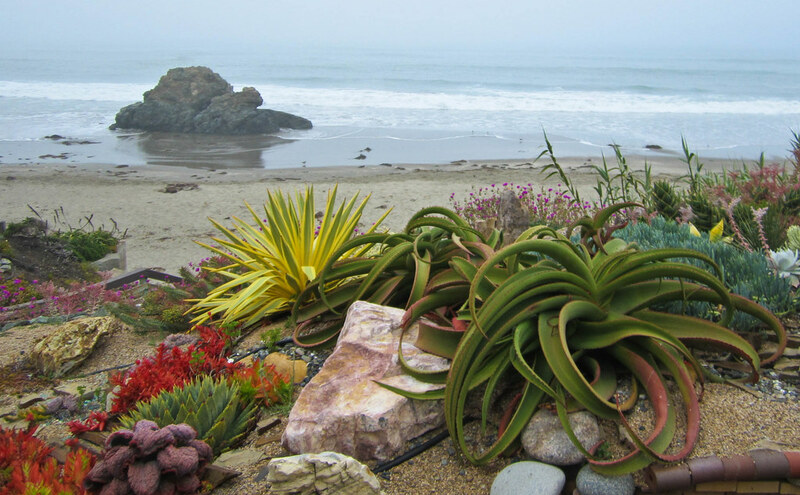 This is a garden that benefits from the cool coastal location and has a lot of tender specimens that don’t like it too hot or too cold. 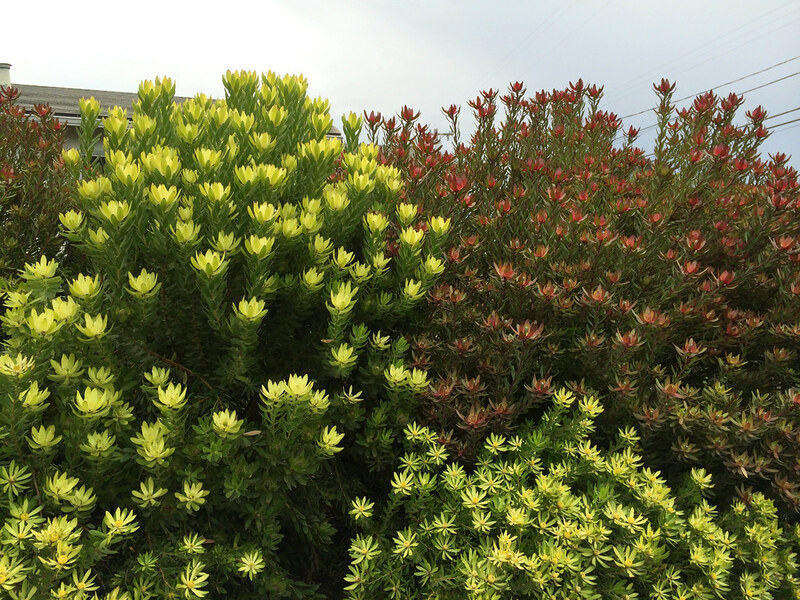 Plants like Leucospermum ‘Scarlet Ribbon’ prefer to live on the coast. Close up of the “ribbons”. The tour was a huge success and I hope that Vince and Janet will be on future tours. 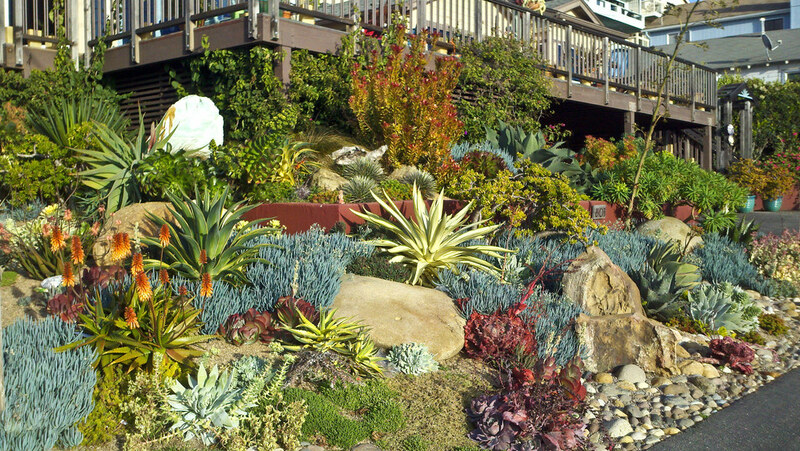 It really is a garden that is worth showing off and I had a lot of fun spending the day with them. And it was perfect that we were in tour mode because the next day Megan and Matti from Far Out Flora were in town. 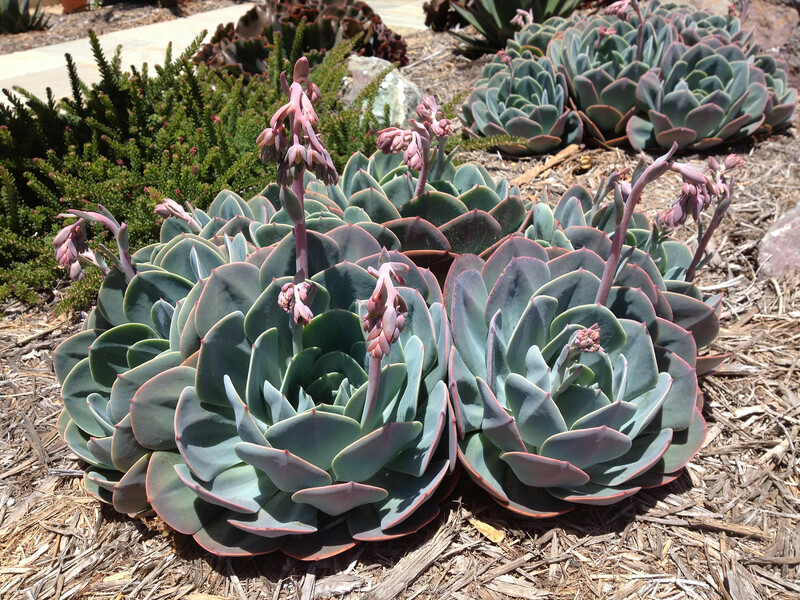 I’m going to assume that everyone who reads my blog is already familiar with Far Out Flora. 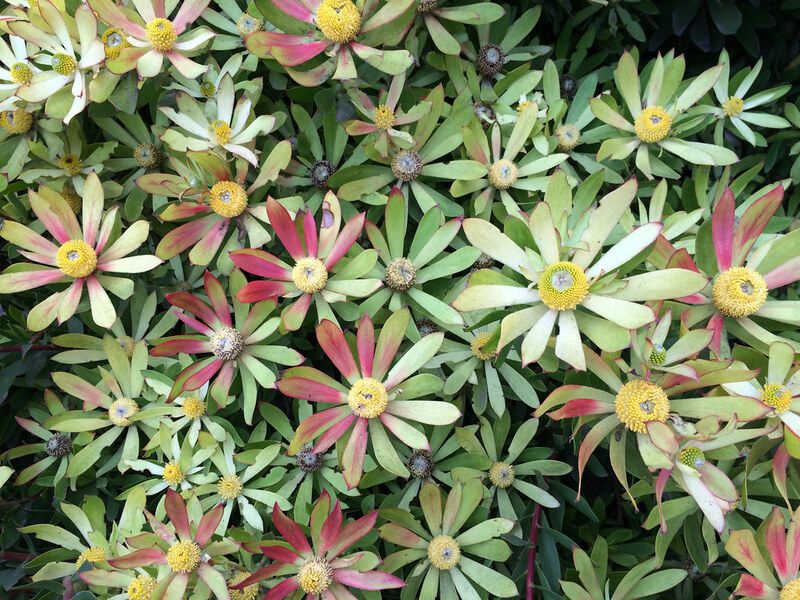 One of the best gardening blogs on the internet and one of the reasons that I started my blog actually. Megan and Matti (and border collie Max) are headed back to Wisconsin to start a family and came to visit me on their way east. OK I think they actually came down the coast to pay a visit to Lotusland in Santa Barbara but we’ll pretend they just wanted to visit me. I had them meet me at my place (didn’t want my garden to seem anticlimactic compared to the other cool gardens we would visit) and then we headed over to meet Gabe and Maggie at Vince and Janet’s house. 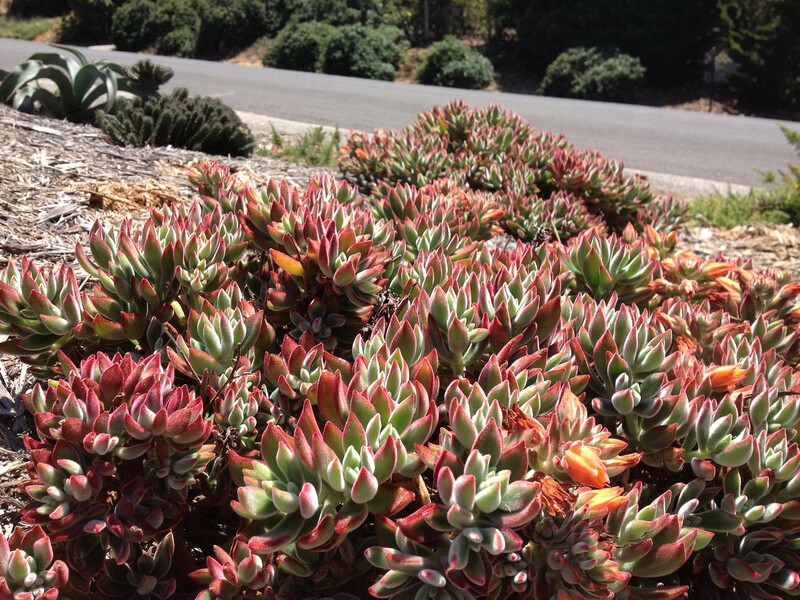 I thought they would appreciate some cool central coast gardens. 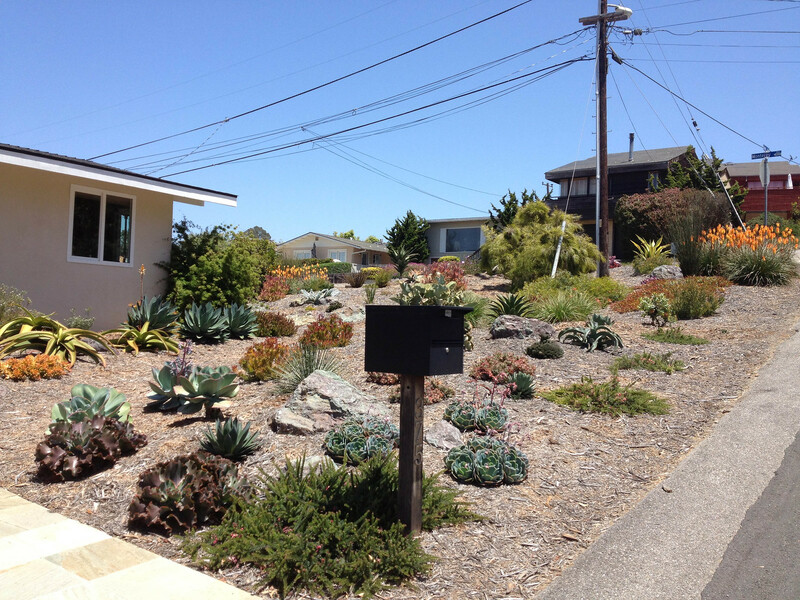 Next we brought them up to Cayucos to show them a few gardens designed by Nick Wilkinson of Grow Nursery. 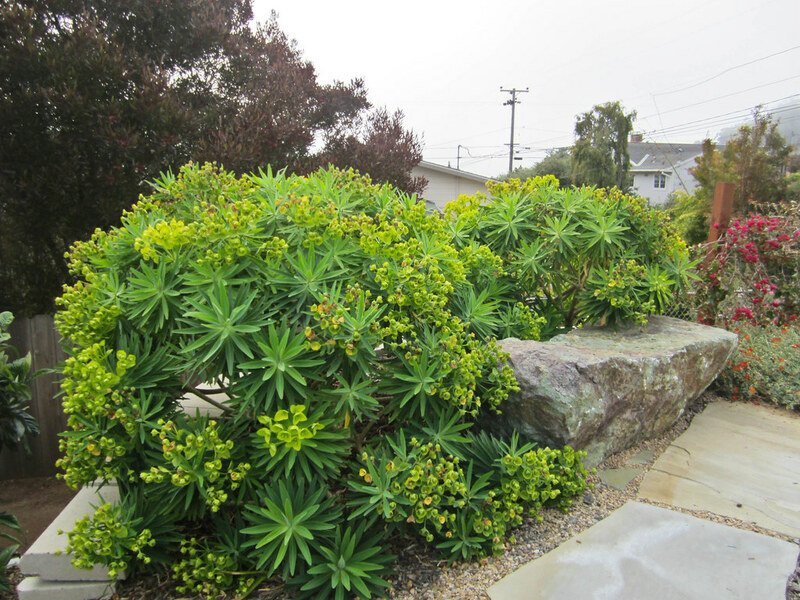 First stop was the garden of Nick’s parents house in Cayucos. Now I’m going to cheat a bit. 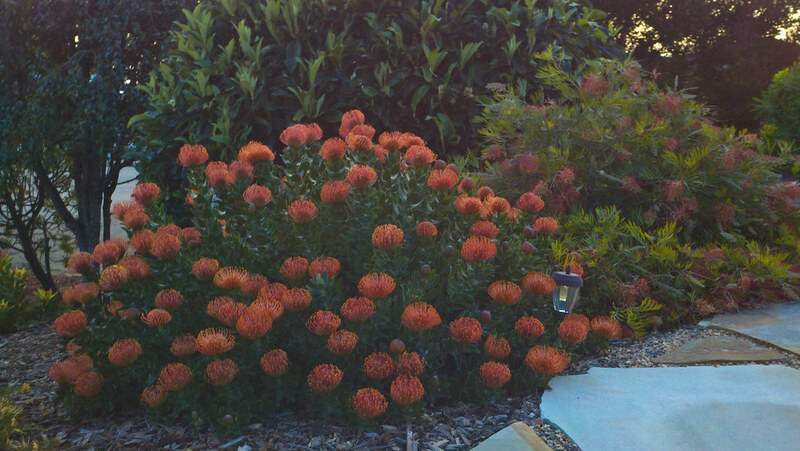 When I am being social I take horrible photos so I have a few older photos that are a bit better and do the garden justice. Hopefully Megan got some good current pictures and will post them when she is settled in back in Wisconsin. 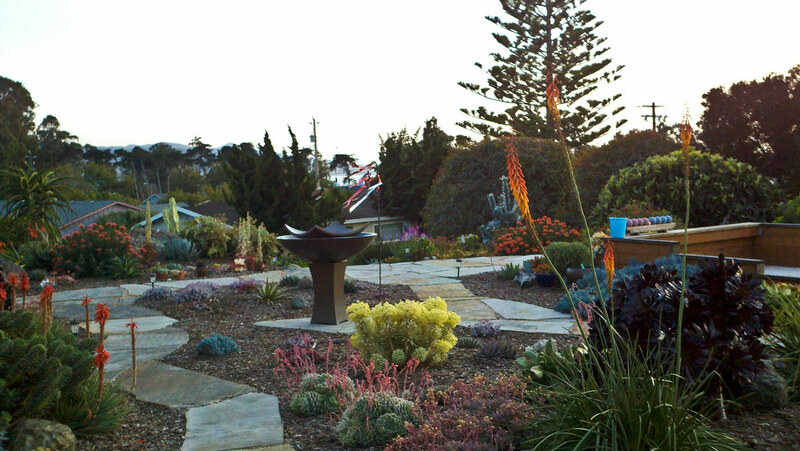 The last garden is another designed by Nick and is just down the road on the beach. Quite a view. 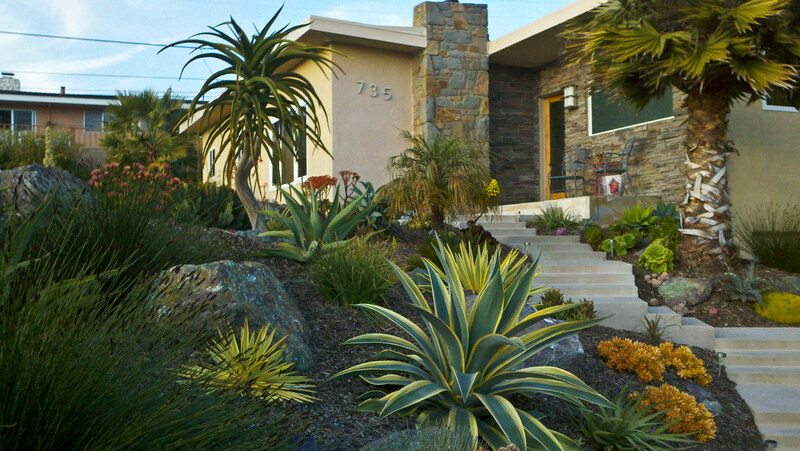 You can watch the sunset and the ocean all the while surrounded by amazing succulents. Anyway now I can go back to my hermit like ways but I had a great time seeing Megan again and meeting Matti (and Max!). 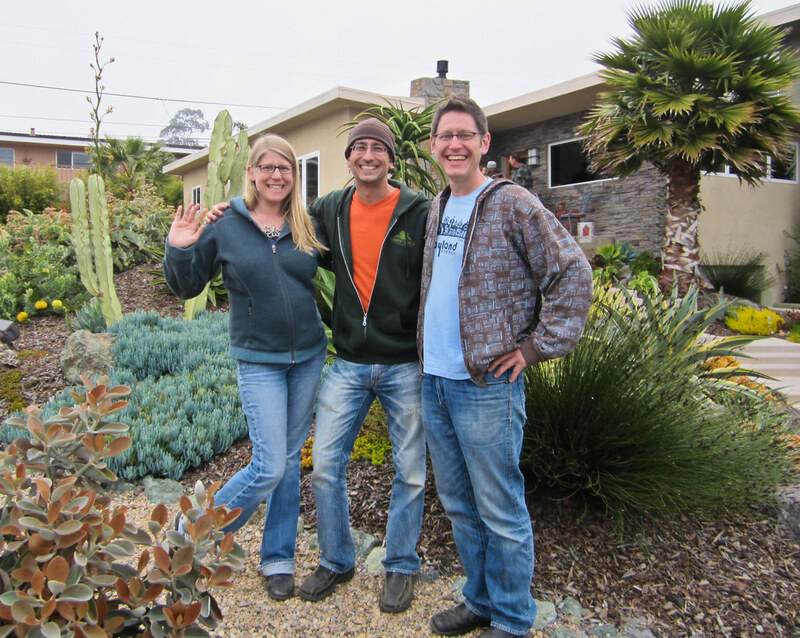 I can’t wait to see their visit to Lotusland come to life on their blog and can’t wait to see how their blog transforms itself from a San Francisco Bay area garden blog to a Madison, Wisconsin garden blog! And hopefully if they ever find themselves on another road trip on the California coast they will pay us another visit. Gabe and I hung out at Vince and Janet Marino’s garden on Sunday to help them out with a garden tour (very successful I might add! They must have had at least five hundred visitors). 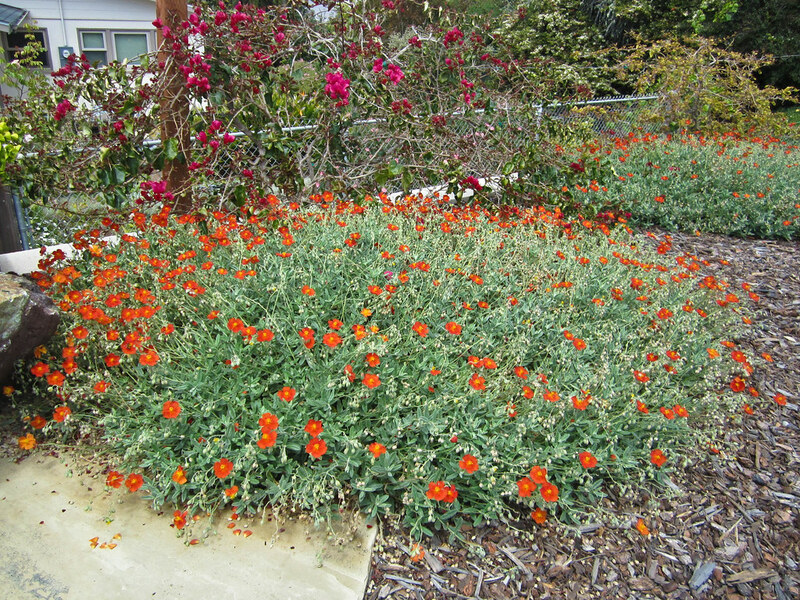 When we first arrived I noticed several specimens of this particular cultivar of Helianthemum (aka sun rose or rock rose). 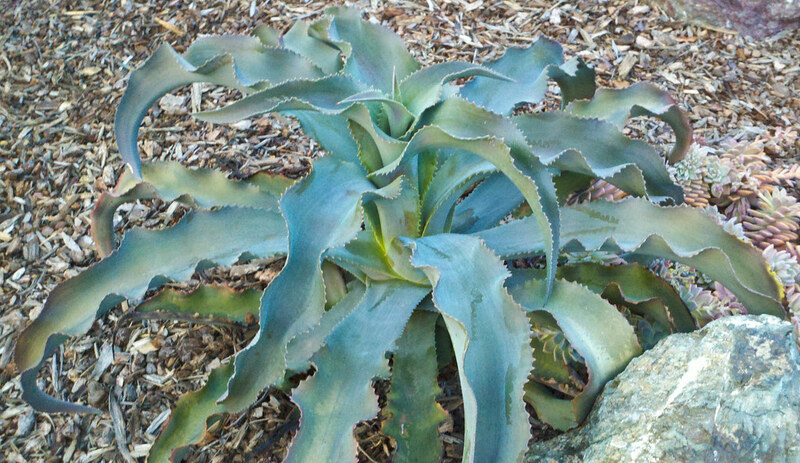 The plant pictured above is a SINGLE plant. 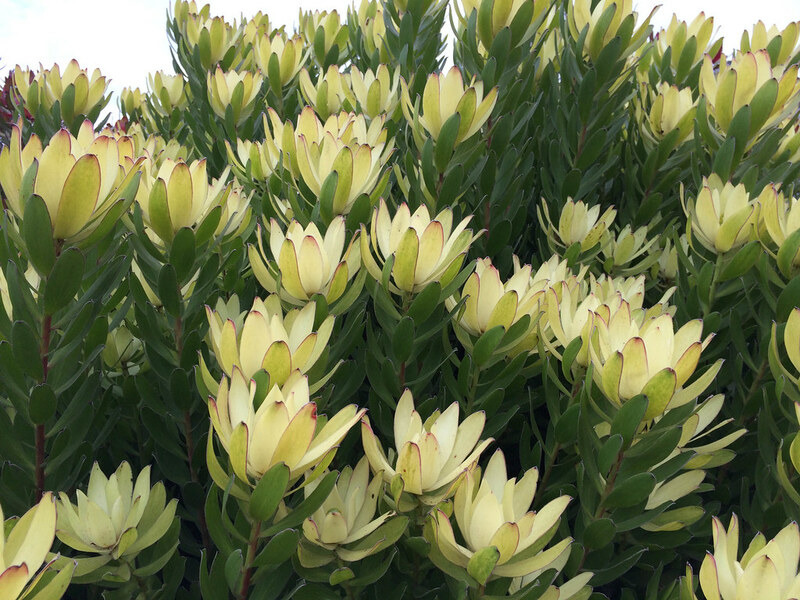 They are generally listed as a large cultivar growing to a maximum of about three feet across but this one must be at least five feet wide. 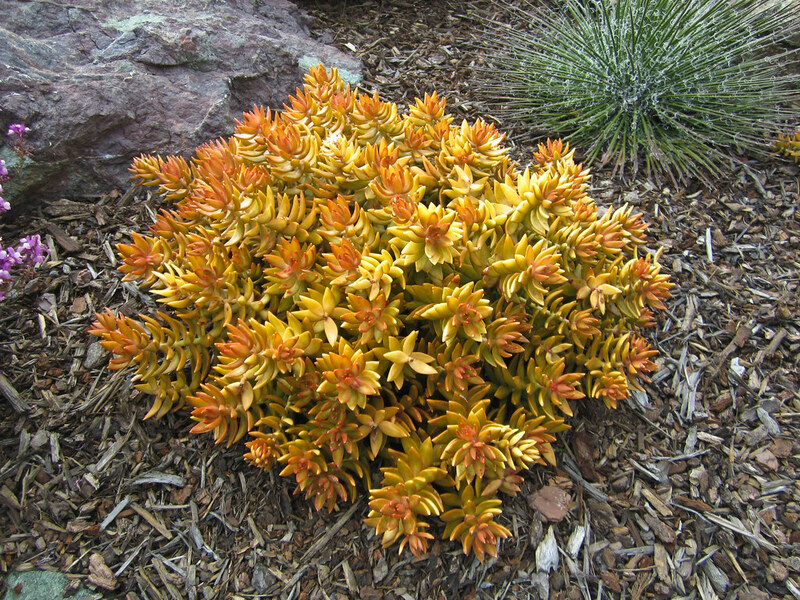 Helianthemums want excellent drainage and full sun but are otherwise pretty tough plants. Here on the coast it appears that some of them can grow quite large. I may have to rethink the placement of the one in my garden. That is the common name for it. I don’t know the scientific name for the Giant Rock Moving Truck. I sent Gabe a text to ask him and as soon as he responds I’ll let you know. Or if someone reading this is smarter than I am about giant trucks feel free to comment. 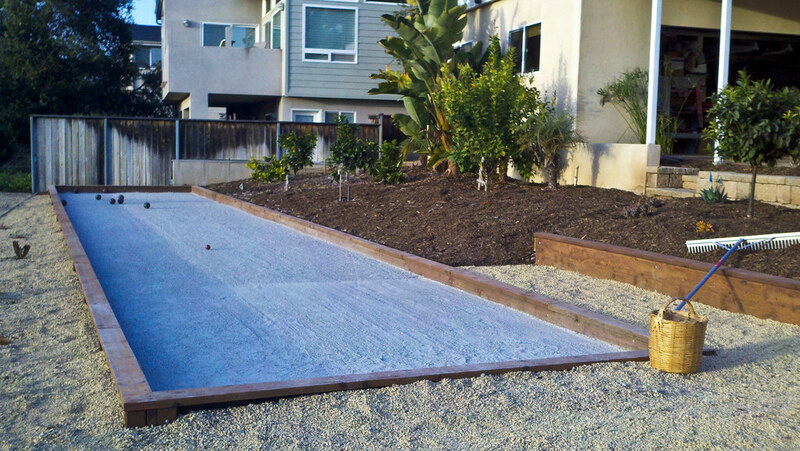 I thought it would be cool to show you this part of the garden building process that we started the other day. 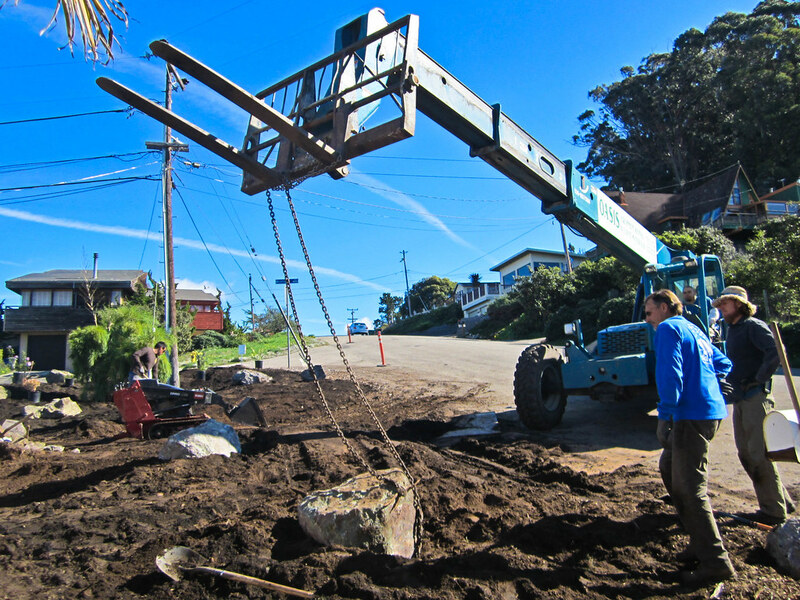 Here is the Giant Rock Moving Truck waiting while the rock is prepped. We don’t own this bad boy. It has to be rented and the pouring rain the other day was a bit of a setback because it wasn’t available the next day. First the guys secure the rock with chains. Victor operates the vehicle while Gabe and David guide the rock into position. You can’t just plop rocks down any old place. 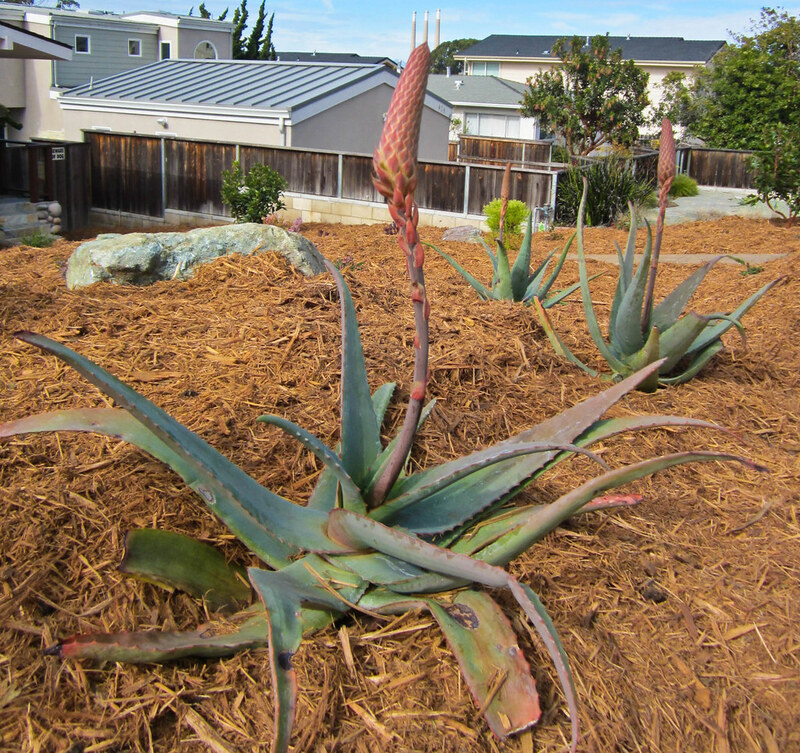 To look more natural they need to be dug into the soil a bit. Then you have to find the rocks best side and set it just so. 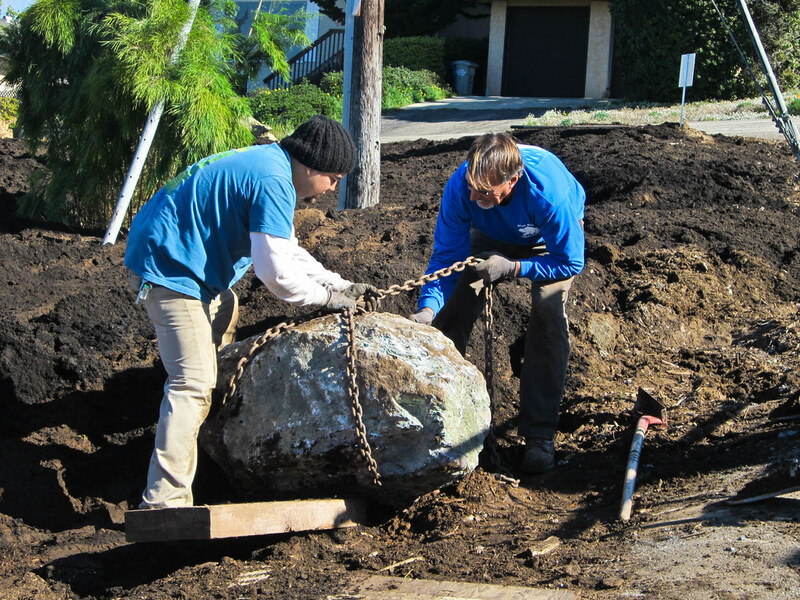 Not so easy when you are dealing with boulders that are hundreds or even thousands of pounds. 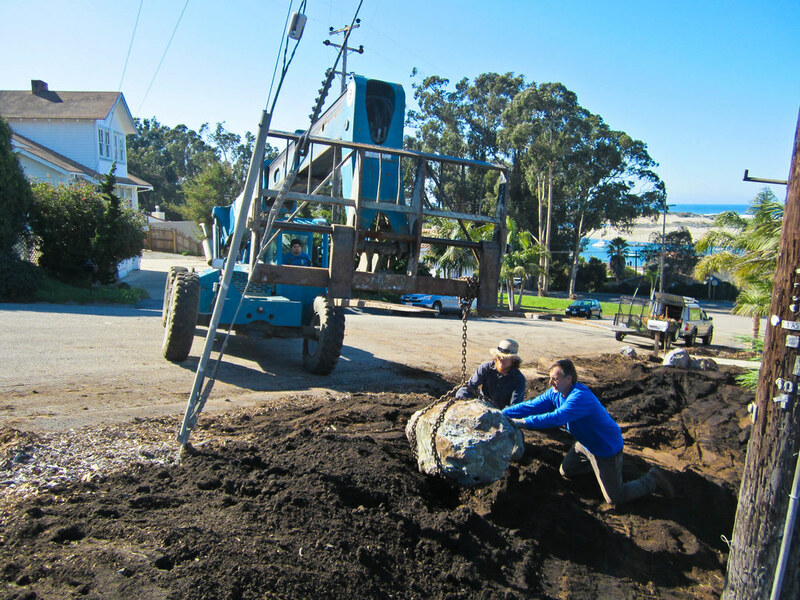 Smaller rocks can either be rolled or moved with the Dingo (the little red tractor over on the left). It is also useful for moving large quantities of soil around fairly quickly. But for the big rocks the Giant Rock Moving Truck is a necessity. I’m not really sure what the cutoff size or weight is. As I’ve mentioned I am the plant guy and I find rock moving to be a little bit scary. 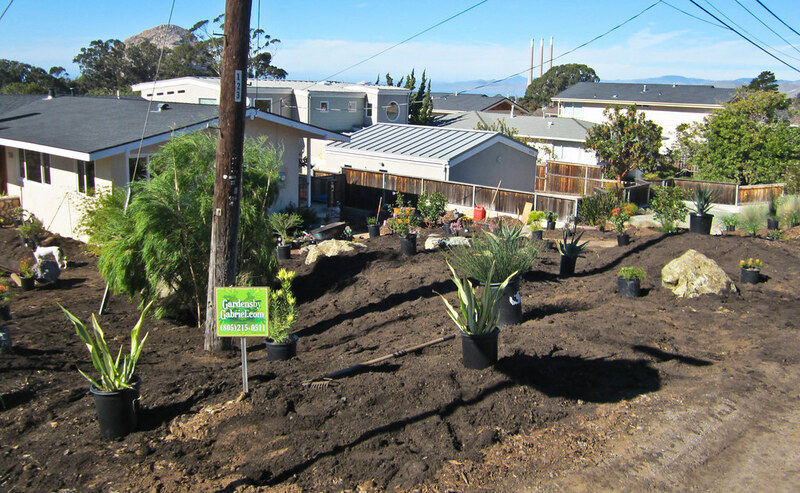 Everything went very smoothly though and Gabe and the Gardens by Gabriel crew did a great job creating the planting berms and placing the rocks. 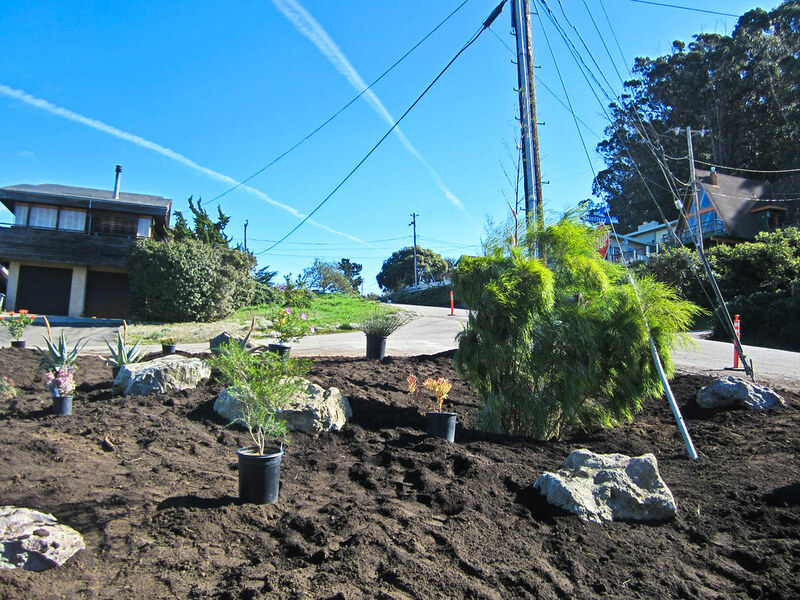 So I was able to get involved with the much more exciting task of placing the plants. 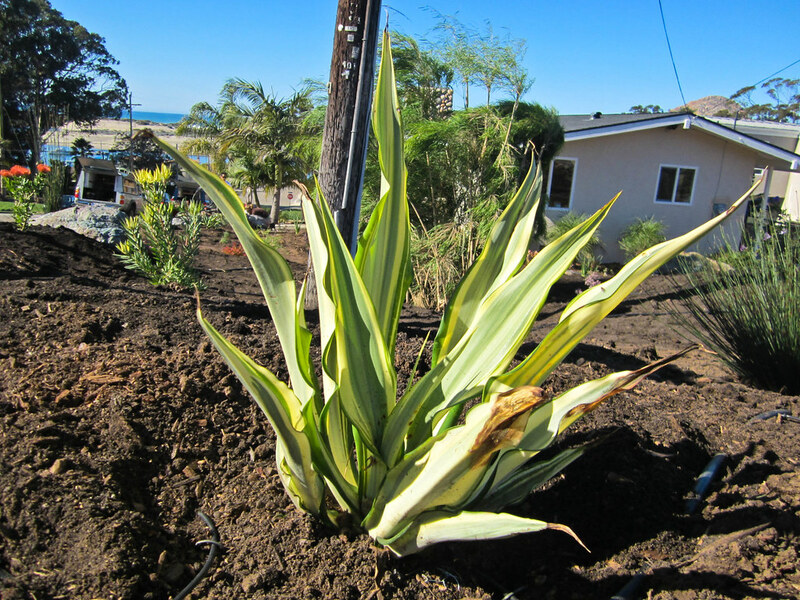 Remember the telephone pole I talked about in the last update (January Garden Design Update)? 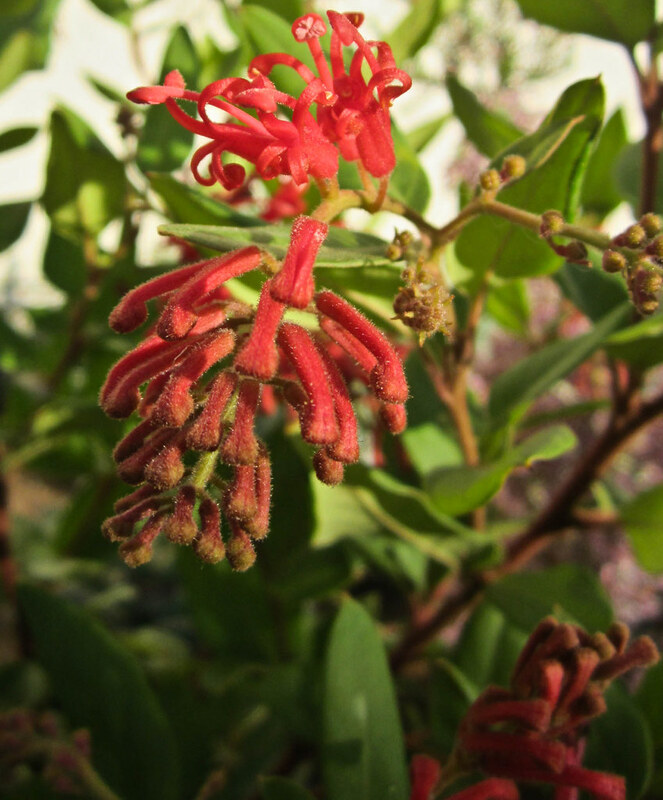 We were very lucky to have a large specimen of Otatea acuminata ssp. 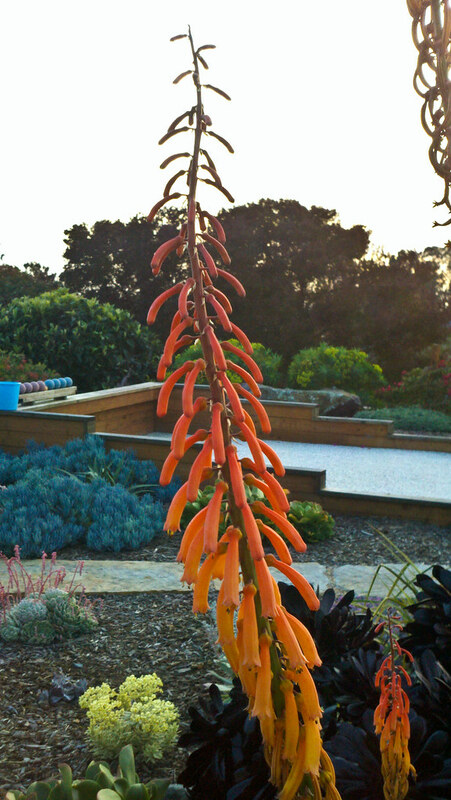 aztecorum (Mexican bamboo) on the property. It was very poorly placed right up against the foundation of the house but rather than just dispose of it we carefully dug it up and moved to its new position (and when I say “we” I mean the GBG crew. 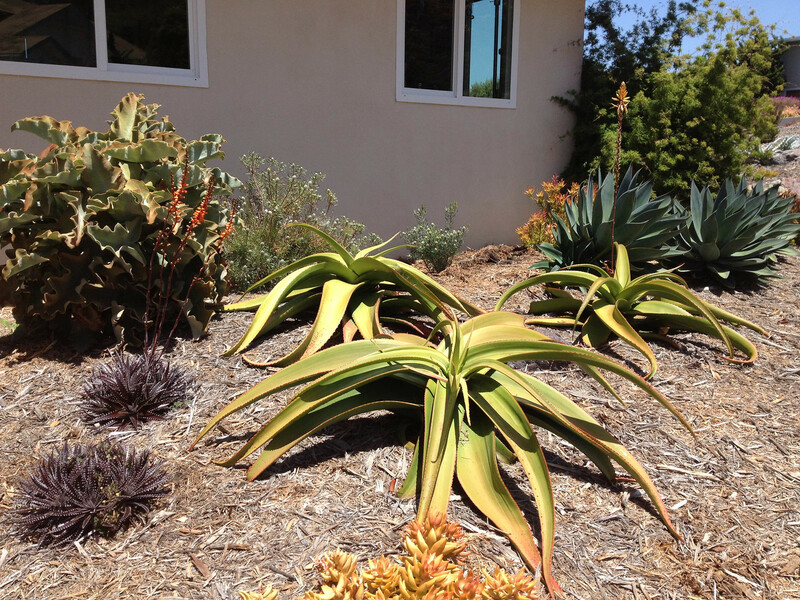 My giant plant digging days are over). 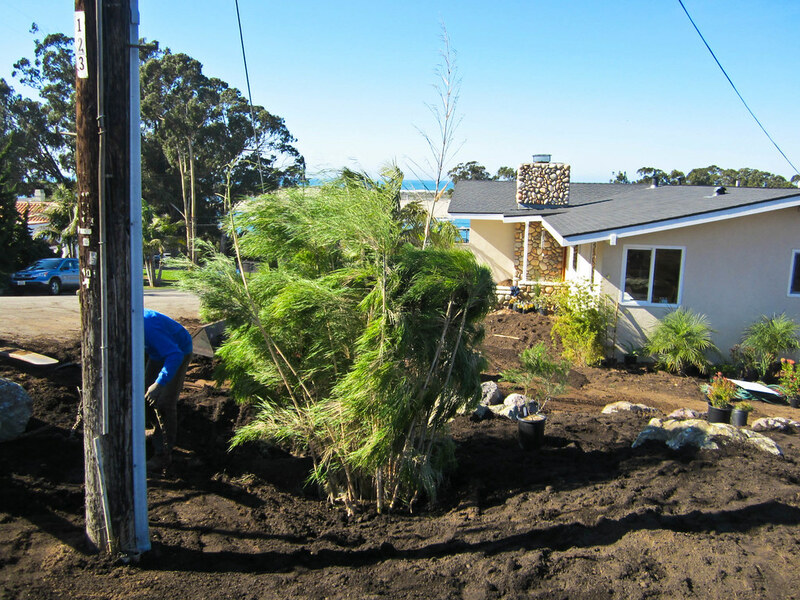 Huge utility poles on your property are never fun and they are impossible to completely hide but in time this bamboo will reach up to twenty feet tall and its graceful arching stems will help mask this eyesore. The network of telephone lines and wires you just have to try to tune out. 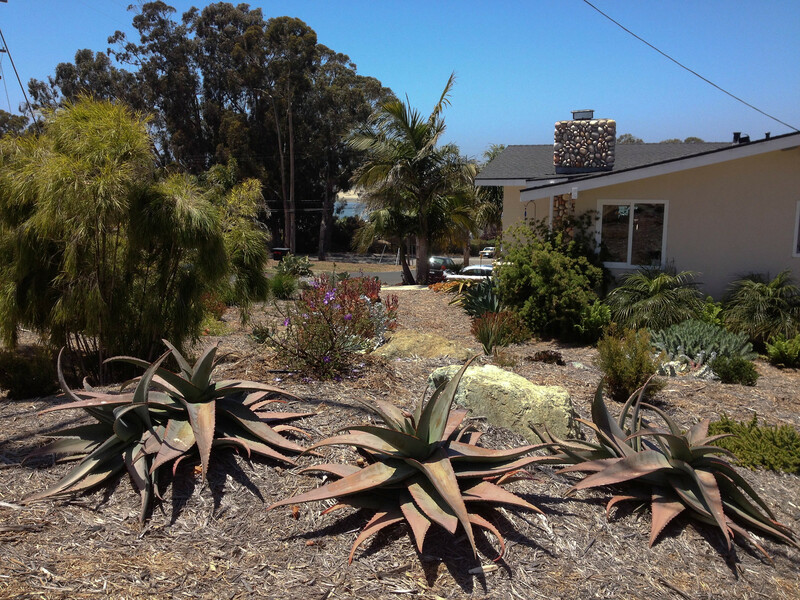 This is the view from the house that we were trying to beautify a bit. 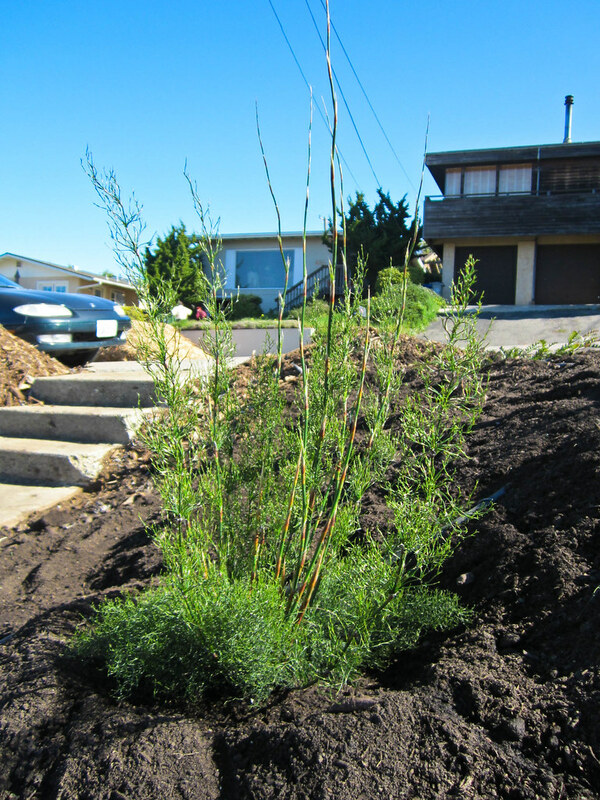 If you imagine the Otatea twice as tall as it is now (and you can see one new big shoot reaching upward) and then gracefully spreading out you can start to imagine it as a screen. 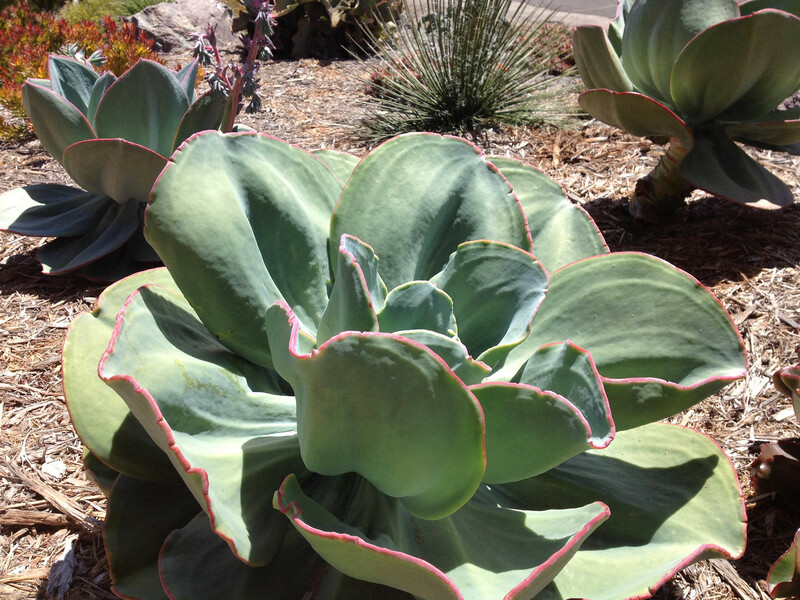 We were very lucky to have this very large specimen on hand to give us a bit of instant gratification. 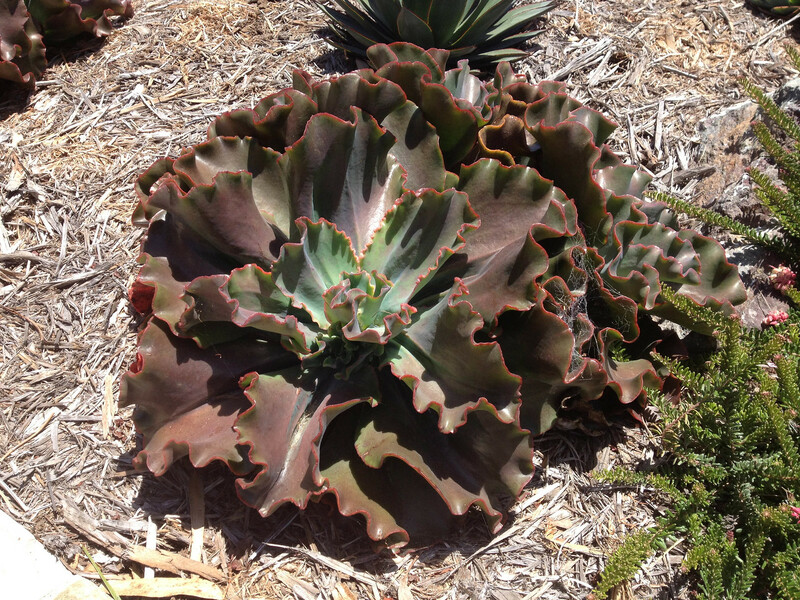 A plant that size would probably retail for well over a thousand dollars. 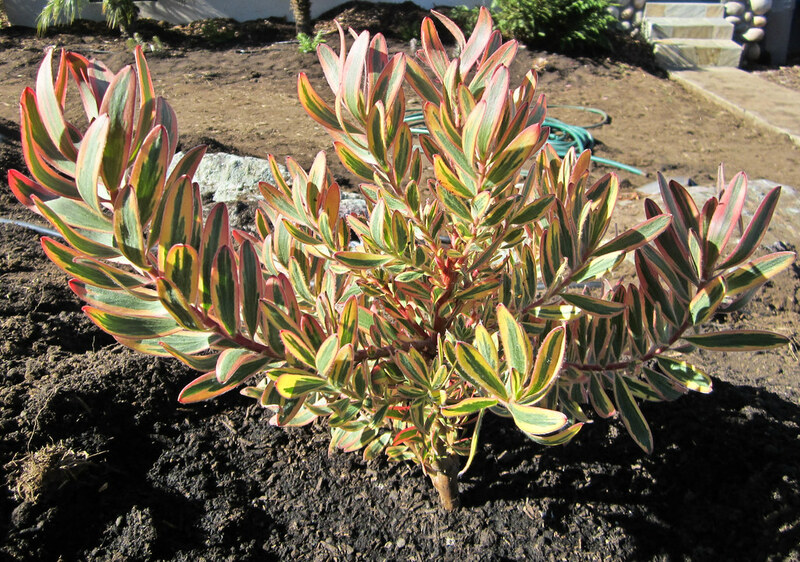 One of the exciting things about my move up to the Central Coast is now I can make myself available to help place the plants for my designs. Nothing ever works out exactly how you plan it on paper. 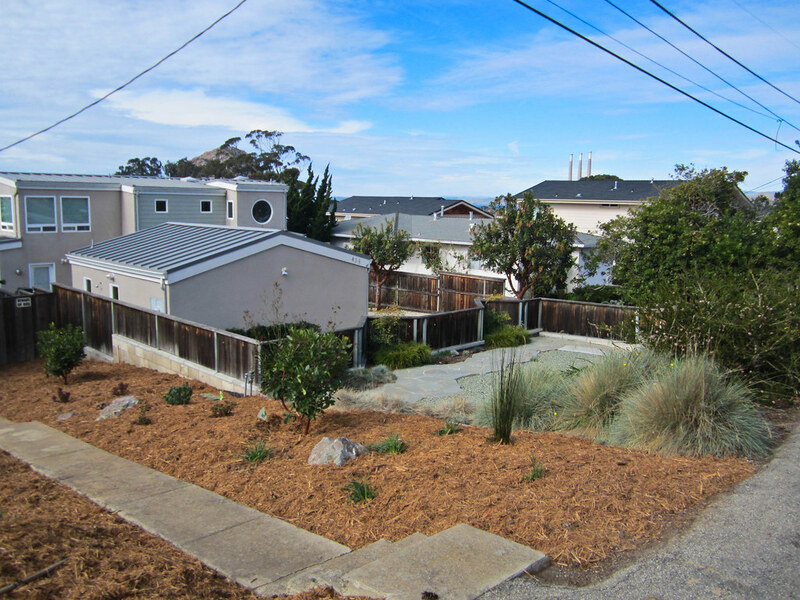 There might be existing irrigation that wasn’t taken into consideration or a specimen plant that wasn’t available that could change the entire layout. 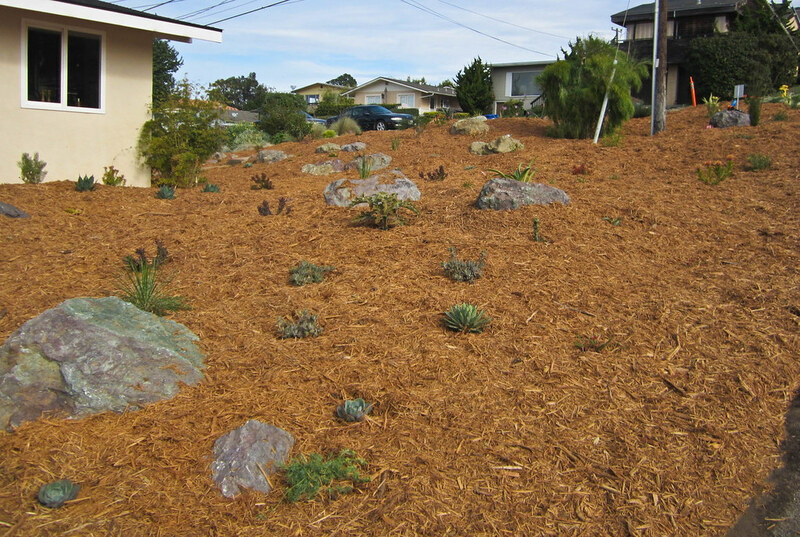 In this case there were some changes to the shape of the berms and the placement of the large rocks. Since I was around I was able to make some modifications and keep the design true to my original vision. 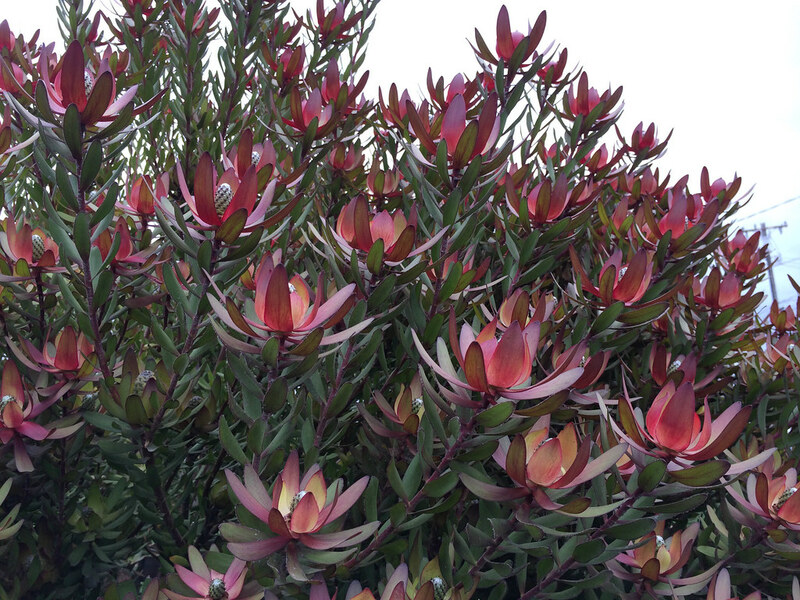 Plants never look exactly the same in real life as they do on paper. You always have to keep an open mind and move things around a bit before you plant them. 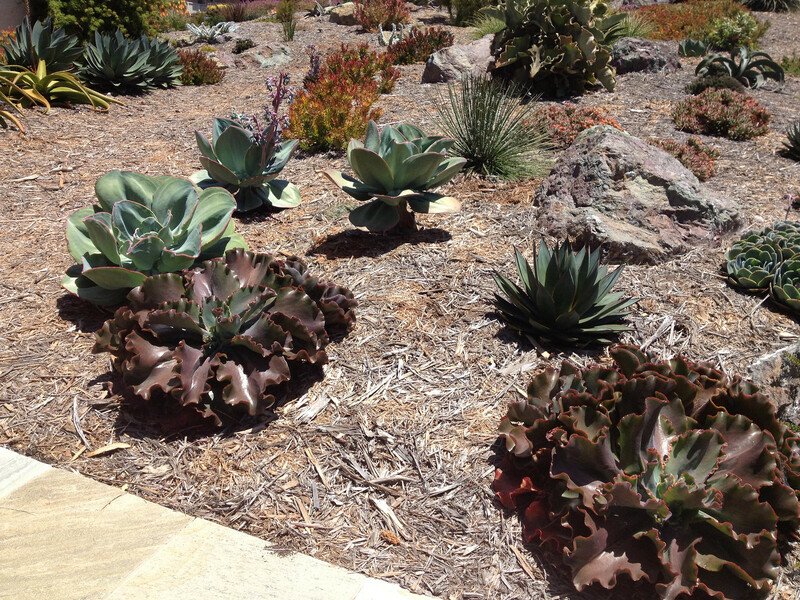 Now for a few more plant highlights from the design. 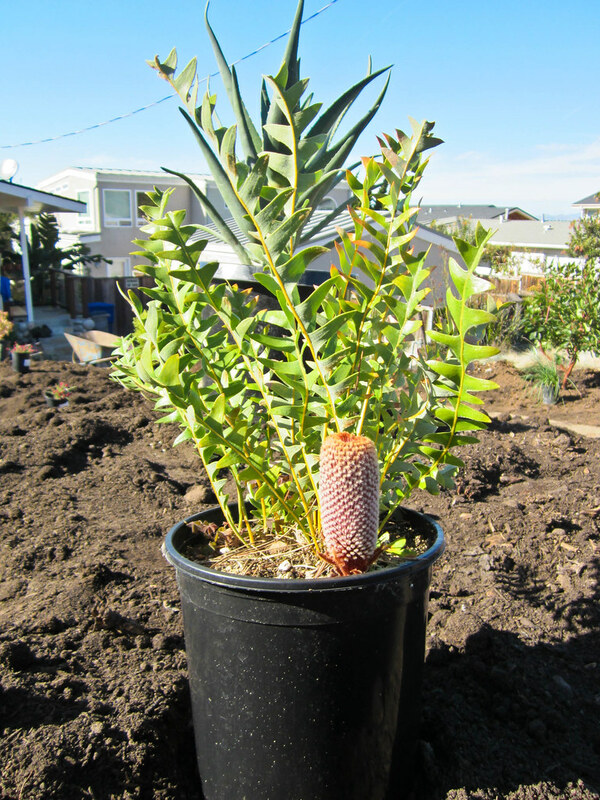 This is Banksia blechnifolia. 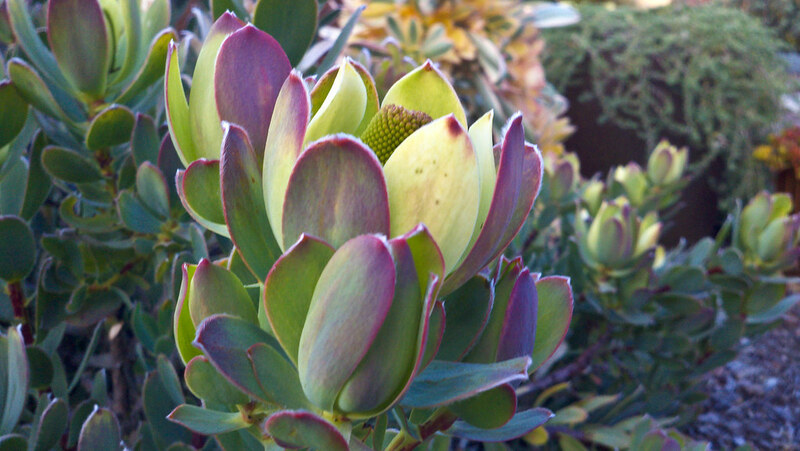 It is native to the coast of Western Australia and a member of the Protea family. 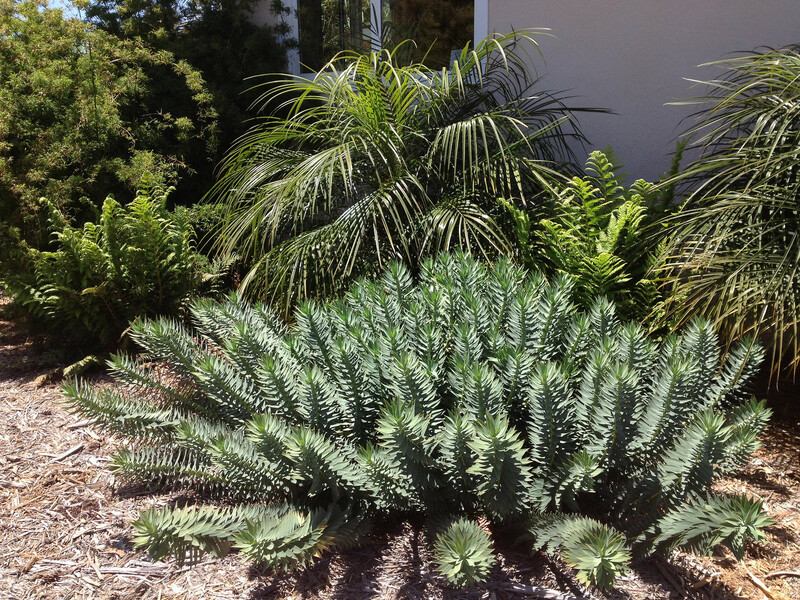 It has upright fern-like foliage and its cone like inflorescence occurs right at ground level. 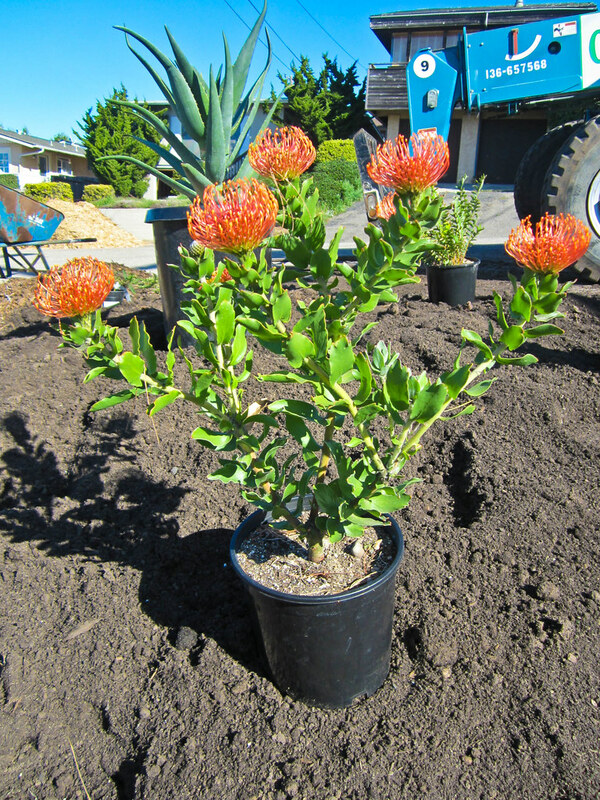 Leucospermum cordifolium (pincushion) from South Africa will form a nice winter blooming mound. 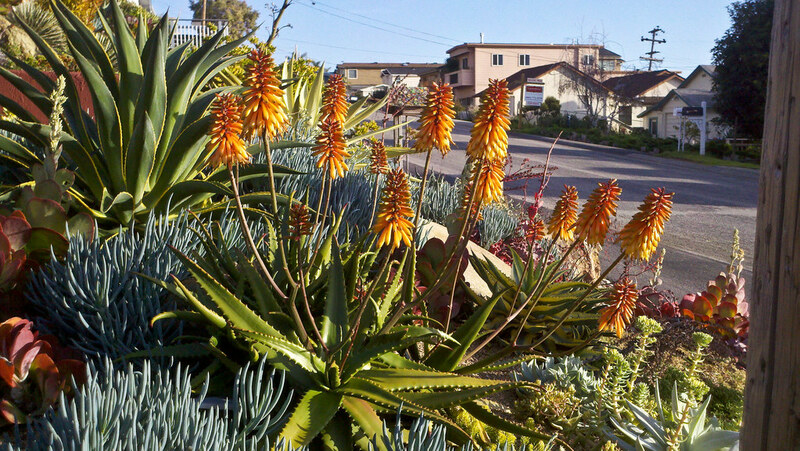 They are very popular along the California coast. 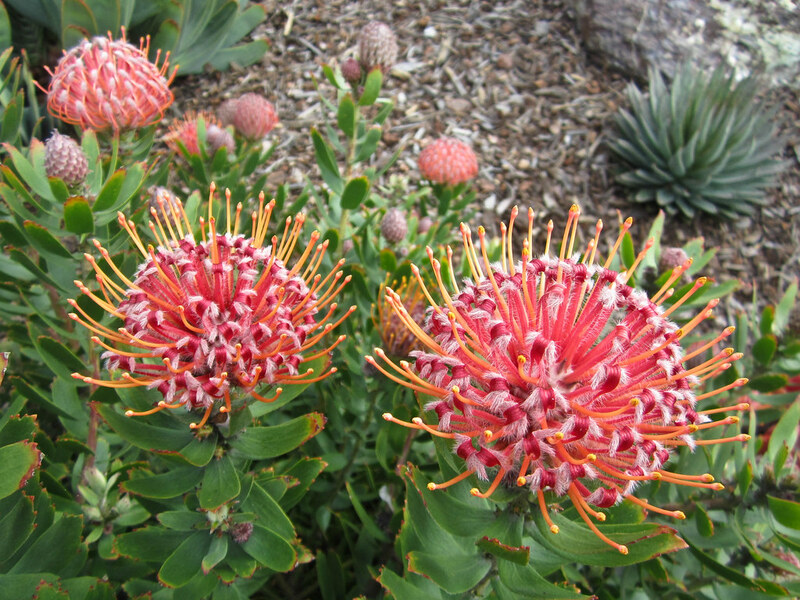 Banksia ‘Birthday Candles’ is a dwarf cultivar of Banskia spinulosa var. 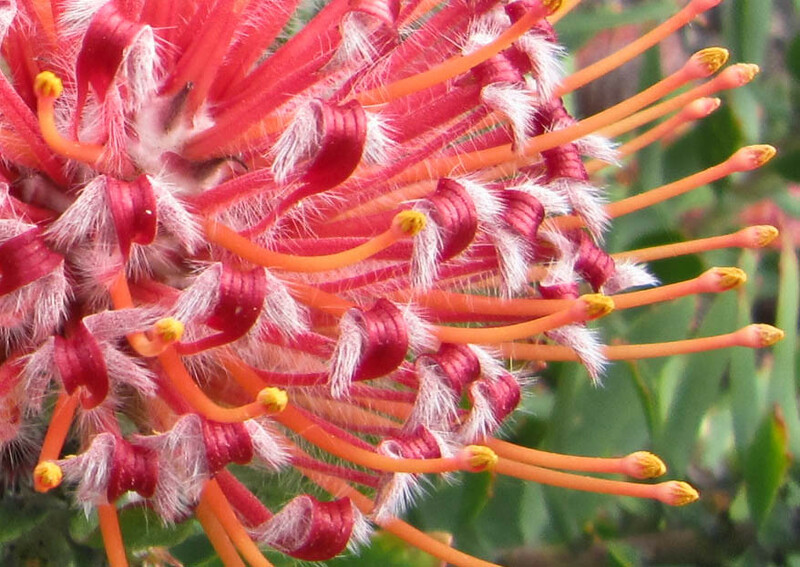 spinulosa from Eastern Australia. 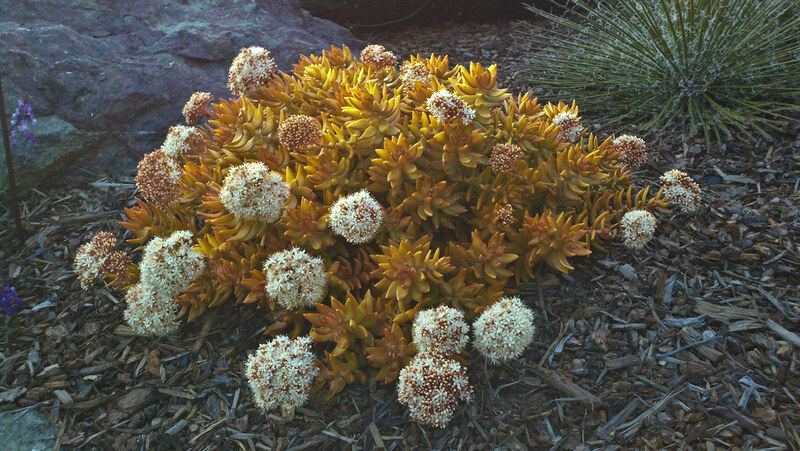 They look a bit like little mugo pines covered in yellow flowers. Alyogyne huegelii is a Hibiscus relative from Western Australia. 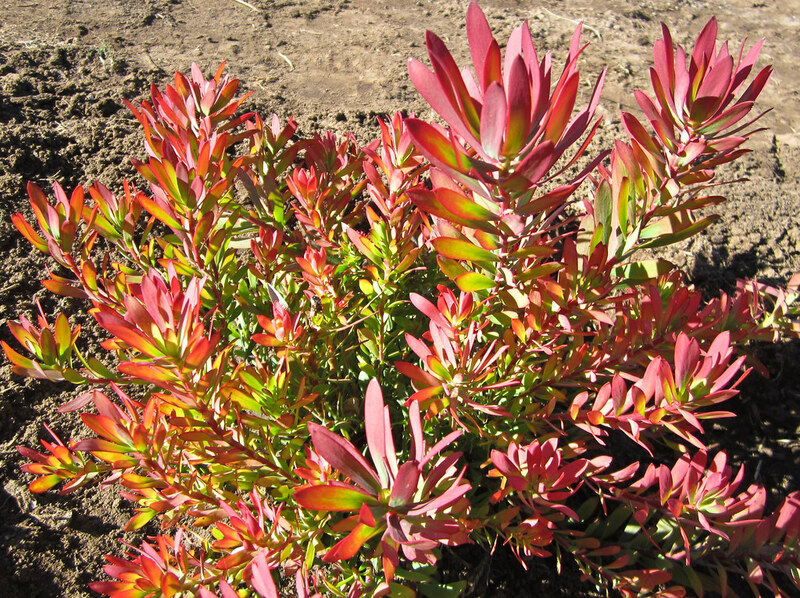 It will grow eight to ten feet tall and will form part of a backdrop of purple and pink flowered shrubs along the central spine of the largest berm. 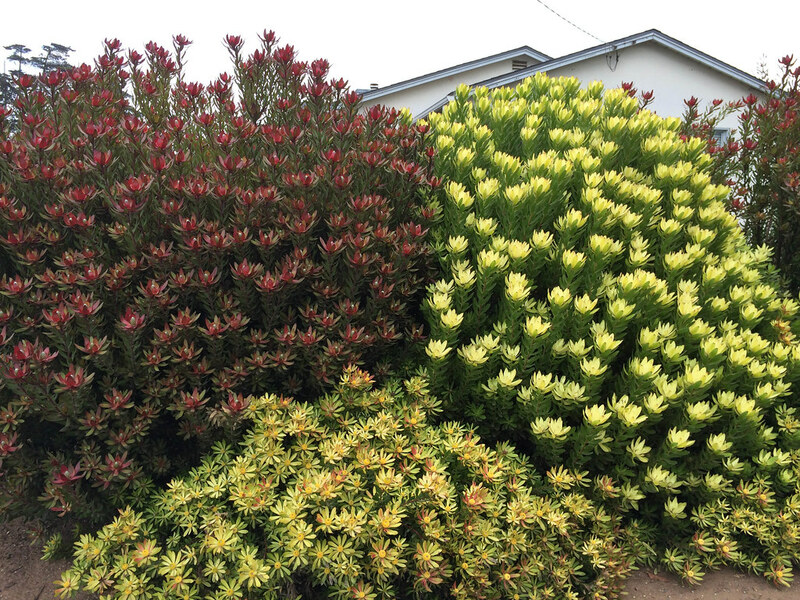 I think the cool pinks and purples will make a nice contrast to the hot flowers of Banksias, Leucadendrons, Aloes, and Kniphofias that surround them. 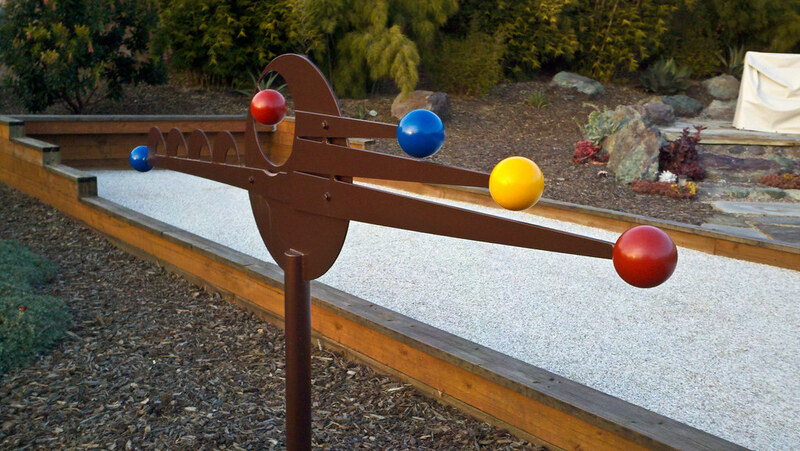 I hope you have enjoyed this part of the garden design process. 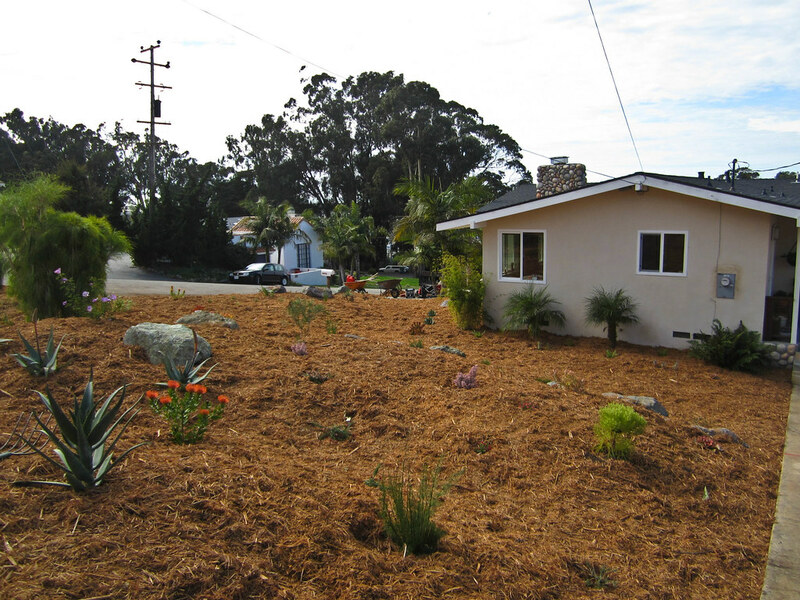 I’ll share more pictures of this garden once the plants are all in the ground and mulched. 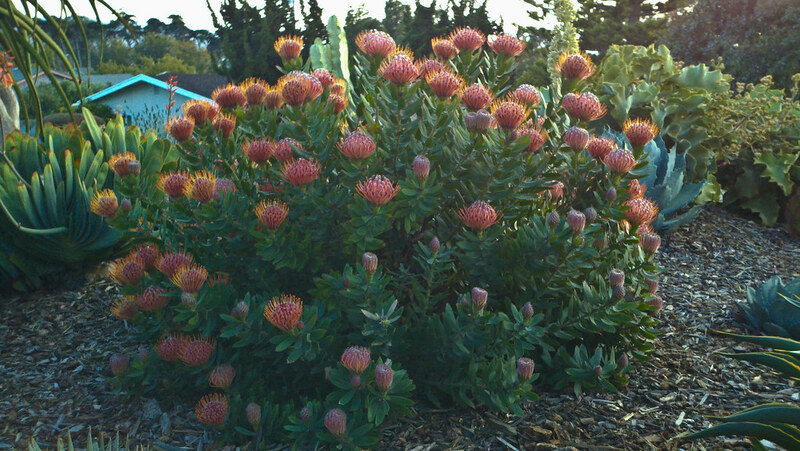 I’m really pleased with the way this garden is progressing so far. All the color and texture combinations I planned on paper are actually working really well. I think it will be a knockout garden. 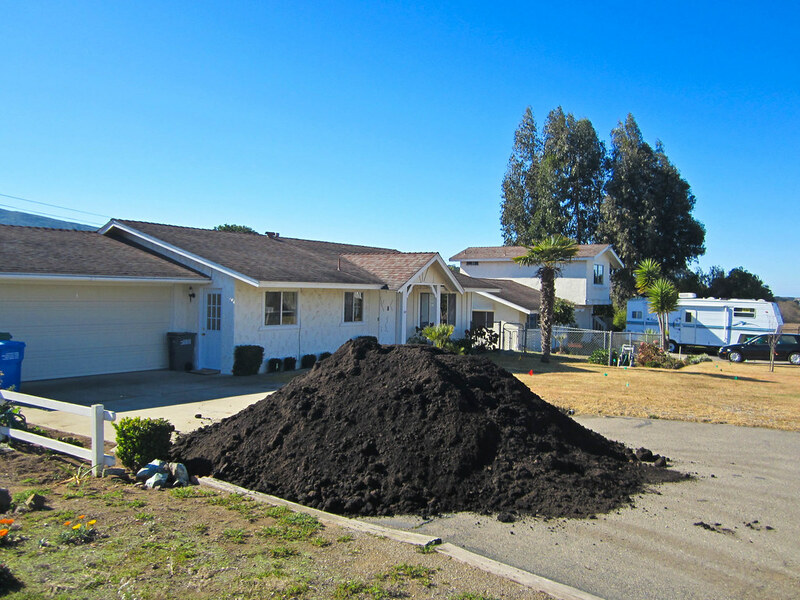 My compost was delivered today for my garden! I have a lot of work cut out for me this weekend spreading it around but luckily I have some helpers coming over on Saturday to give me a hand. 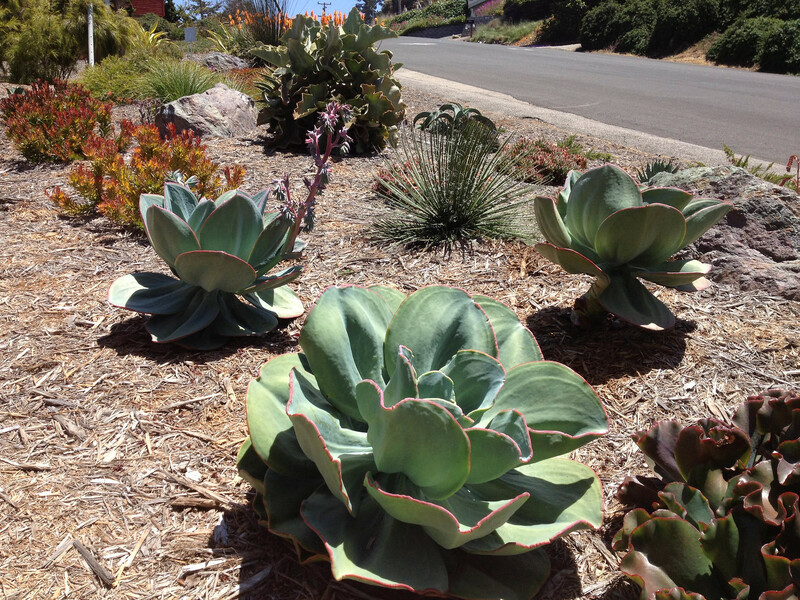 I’m really looking forward to getting my own garden planted and sharing that with you.